The General James A. 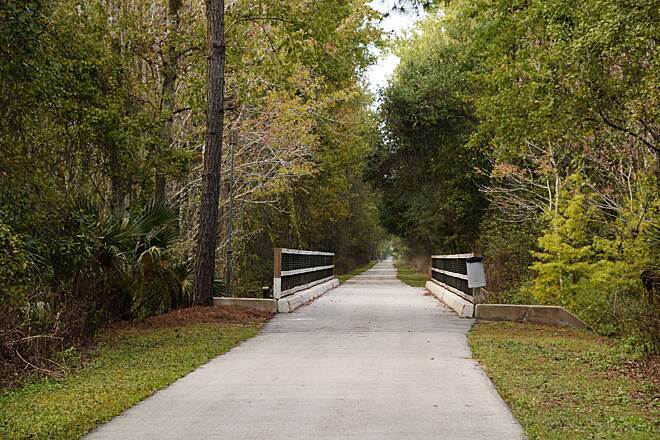 Van Fleet State Trail runs 29 miles through some of Florida's most scenic rural landscape. 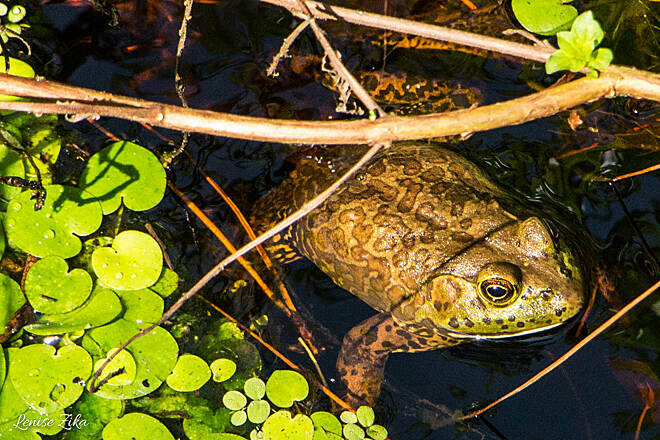 If you are looking to immerse yourself in wetlands and wildlife, it will not disappoint; at least one-third of the trail crosses central Florida's 322,690-acre Green Swamp. 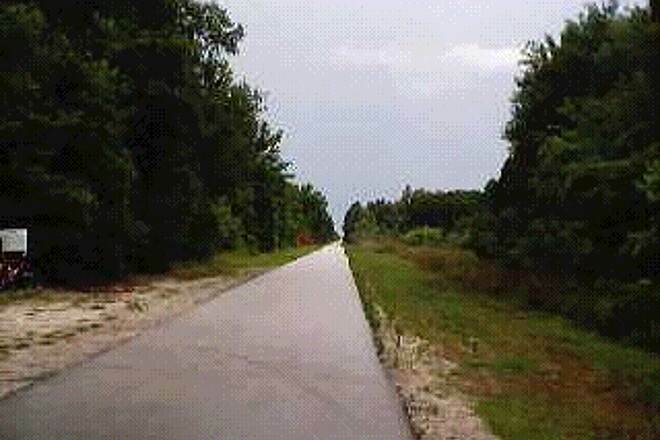 The trail stretches from Polk City north to the town of Mabel on State Route 50. 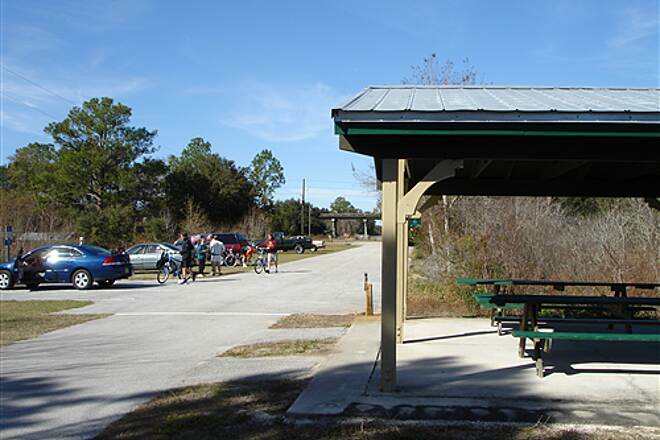 The Polk City trailhead offers ample parking, picnic and restroom facilities, plus an expansive field of clipped grass, perfect for a game of pickup soccer. 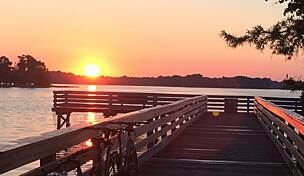 From the Polk City end you can also head south to Auburndale along the Auburndale TECO Trail. The flat and arrow-straight route, with one slight curve around Mile Marker 5, have made it a favorite among time-trial bicyclists, though thanks to its remote setting, you'll likely encounter only the occasional speedster. 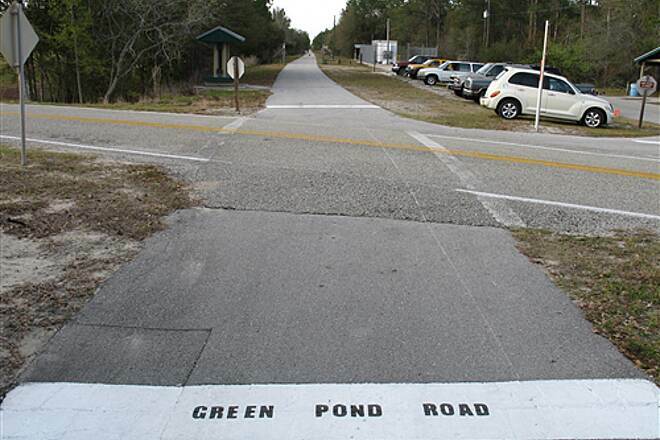 The Green Pond Road trailhead, near Mile Marker 10, marks the boundary of the Green Swamp, one of Florida's protected wetland and wildlife areas. From here on watch for feral pigs, armadillos, buzzards, tortoises and possibly an alligator or two basking on the trail's warm asphalt surface. While the Bay Lake trailhead signals the end of the protected reserve, the final 10 miles of the to the Mabel trailhead are every bit as scenic. 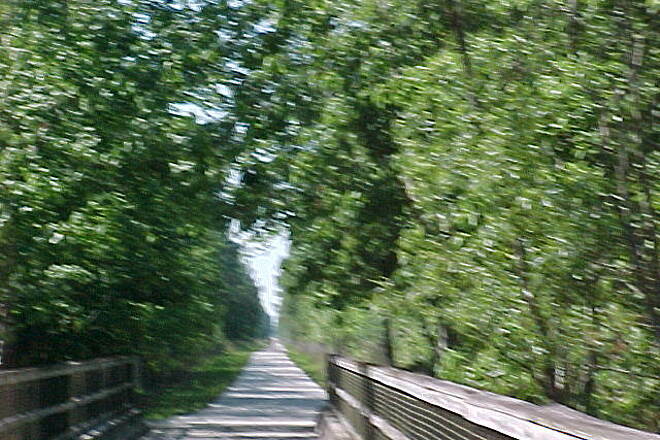 The decision is yours whether to race back to Polk City or savor the return trip along this beautiful, serene trail. To reach the Polk City trailhead from Lakeland, take I-4 east to Exit 38/Polk City, and follow Route 33 north to Polk City. The trailhead is at the intersection of Route 33 and Route 655/Berkley Road. To reach the Green Pond Road trailhead from Clermont, take Route 50 west to Route 33 south. Follow Route 33 about 16 miles to Green Pond Road, turn right and continue to the trailhead. To reach the Mabel trailhead from Clermont, take Route 50 west; the trailhead is at the intersection of Route 50 and CR 772, on the left about 5 miles west of the Route 50/Bay Lake Road intersection in Mascotte. Been riding this trail for over 15 years and it's been a very good place to ride until about a month ago(06/2018 when everything change.The weeds along the trail haven't been cut,the trail has weeds growing in the cracks,the trash cans are always full of trash,and the bathrooms are a mess,no toilet paper,trash on the floors,toilets plugup.The bridge near the Polk City trailhead has been under construction for over a month.Maybe they should bring back Ross.He got the job done. WOW I can not say enough about this trail. We rode all 29 miles of it from end point to end point for 60 miles total. The trail is totally flat. No incline at all. The trail wisp through marsh lands, Wooded land, Pasture fields and small towns at each end point trail head. There is plenty of shaded areas however the areas in the sun can get quite hot for long stretches. Lots of water is required for this ride. 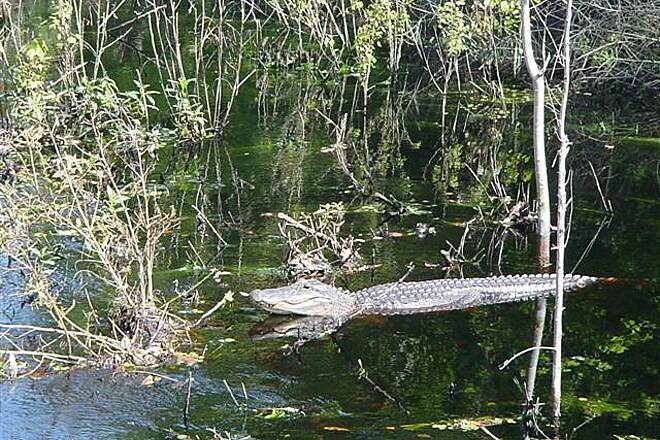 Along the way we say 6 10 to 12 foot alligators one 4 footer and numerous baby's about 1 to 2 feet long. 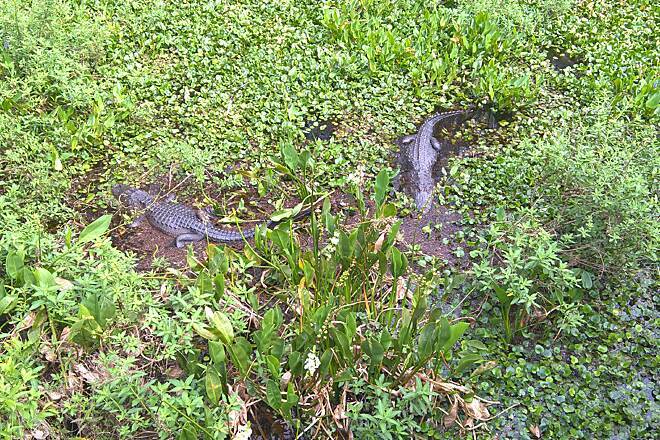 We saw them from one of the many swamp overpasses. We saw none on the path or near it. The ones we saw were close to us but below us. 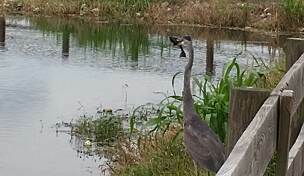 We saw numerous turtles, pelicans, cows,panther,numerous style birds. The trail is about a 50 minute drive from Clearwater and we did that in rush hour. There were nominal places to eat or water fountains in comparison to typical trails. The trail is maintained well. There are sheltered areas to cool off about every 5 miles. The trail was also pretty well traveled the day we were on it. Still it was a pleasant ride. This is a great trail and I rank it 5 stars. I have traveled across the country on great trails. This is in my top five. Just be prepared for the unexpected and bring water. Limited food too. best trail for nature lovers. 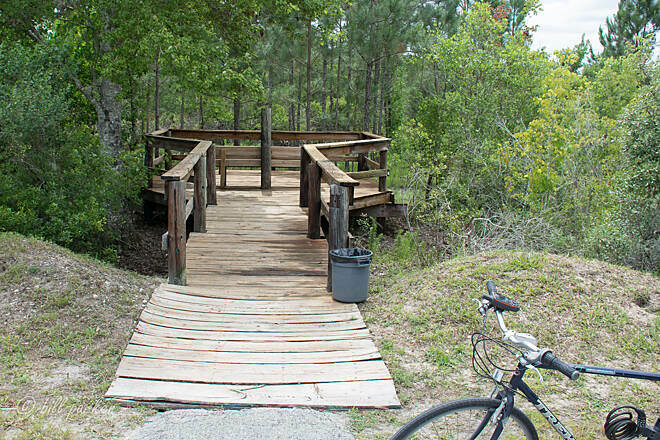 this trail offers a view of nature and wildlife at its best as you ride along the trail. you will need to be on the lookout for snakes and turtle crossing the trail. The trail is clean and well maintained. 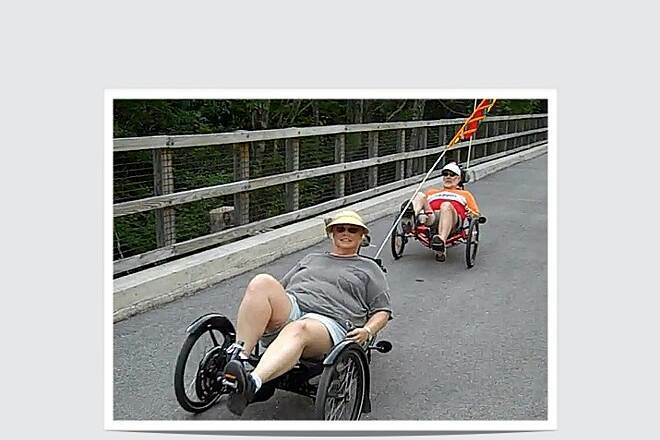 Been on many paved trails from PA to FL. This rates as one of the best. Great scenery and solitude, wildlife everywhere! There are stretches where you will see no other cyclists for miles, especially early in the morning. Make sure to bring a tire repair kit. We started at the Mabel end because we wanted to get water at Green Pond and Polk City. There is no water at Mabel. Lots of shade, lots of animals on the trail. We were surprised that the trail outside of the State Park were just as good for viewing. We saw lots of gators especially from the three bridges 2.5 miles north of Green Pond. 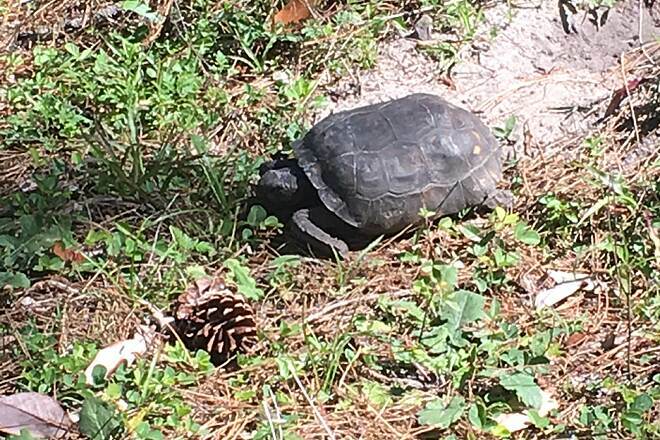 We saw at least 5 gopher tortoises, a pileated woodpecker, vultures and deer along the way. Trail is in great shape but bring enough food for the whole day. Well worth the trip. Went down to ride 6 trails in area last week, this was our favorite, saw alligators in the water and on the trail, gopher and slider turtles, hawks. deer and turkeys. Spent two days here to do whole trail because we stopped and took so many pictures. Smooth ride, trail maintained well, safe parking and friendly company of others riders. I was in Orlando FL area for the Thanksgiving Holiday week. So I decide to bring my bike and ride some of the trails in the area. I started with the Van Fleet and boy what a surprise I got. The trail was well maintain and had bike repair stations about every 2 to 3 miles. The restroom was super clean , well the one I use at the Green pond road trail head. There was Park Rangers on duty, That's a big plus. I talk to a lot of friendly people on the trail. This trail is straight and flat. Makes for some good tempo and SST rides. I rode the trail all week and did not bother trying out the other trails. 10-5 17,,,,,,Trail is closed at Polk City due to Hurricane Irma damage.Haven't checked the Green Pond or Mabel areas. This trail delivers. It is remarkable to have a trail go over 10 miles with only 1 road intersection. surface is in above average condition. the trail is shaded most of the day, except midday when I was there. Turtles, hawks and other animals are a bonus. Good Trail, flat all the way to Polk city. Miss the flat trails, now live in Germany. Lots of nature and an easy ride! We rode this trail on Friday January 27th from about 10am to 5pm. We started from the Mabel trailhead which is mile 29.5 and there is a restroom there. The main issue on this trail is that there is no water except at the Greenpond trailhead at mile 10. That is where we turned around after refilling our water bottle. 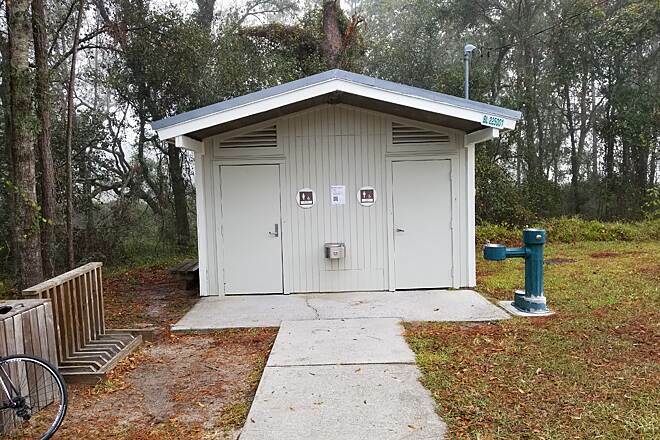 There was one other restroom at about mile 20 at the Bay Lake trailhead which was a compostable toilet and there was parking and picnic tables there. We were not riding for speed but to see the wildlife and there was a lot of nature to see. It was 20 degrees below normal so much chillier than normal with some sun and no wind. We saw river otters, great blue herons, egrets, ibis, sandhill cranes, cormorants, and hawks from the bridges crossing the water. There were many types of woodpeckers and warblers too. Alligators were also out in the water. While this sraight and flat trail can be used for speed it is also a great trail for a relaxing day of wildlife watching. 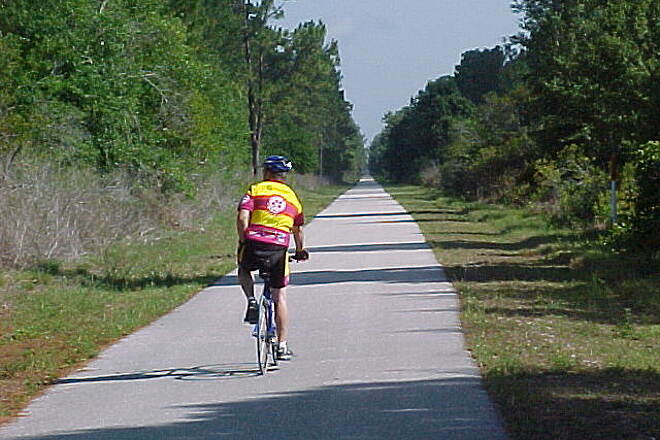 Beginning in Polk City and riding to the other end and back, there is an abundance of wildlife and vegetation. Only needed one gear but a sharp eye helped a lot to see a number of gators (some fairly large) in the waters along the way. They aren't interested in cyclists fortunately. A super ride to relax and enjoy the beauties of nature. Water is not abundant, but easy to manage if you make good use of the fountains at mm10 in both directs. The Zen Trail of Serenity. If you want to just get on your pedals and disappear into a hard fought speed ride with an amazing backdrop this ride is perfect. 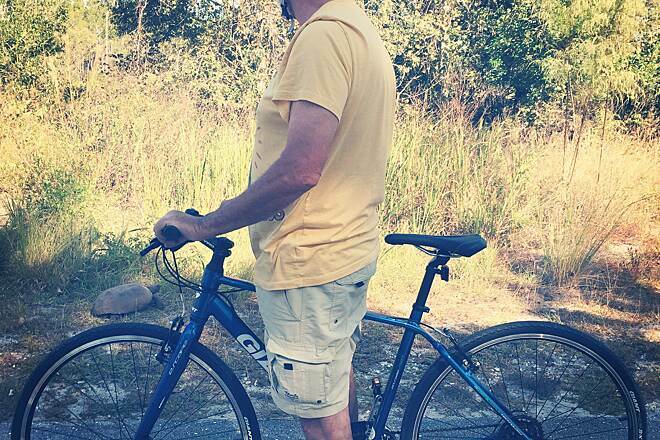 But it is also just a Serene Ride if you want to stop along the way and look at Florida's natural scenery and wild life. it doesn't have the diversity of some other trails but by the end I realized it didn't have to. Miles are marked and benched stations for cyclists are prevalent along the way. Out of the way but worth every minute getting there. We are visiting Florida and we are geocachers. We happened to see this trail nearby and it had caches along it. We were worried that it would be hot hot hot, but we started early and almost all of the trail we rode was shaded. Nice and straight. 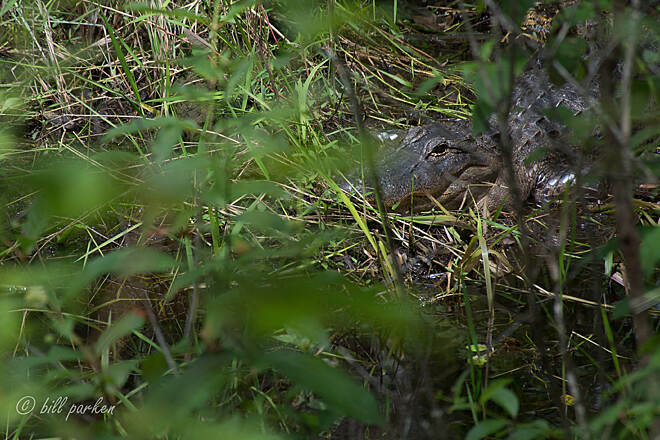 Didn't seen any animals other than a deer and a squirrel, though hikers we talked to who hiked and biked the trail often, said they do occasionally see alligators. Nice bathroom at the Mabel trailhead and some benches along the way. Well to see what it is now to what it was when they first took out the tracks, it amazing! I have done it a few times, I like it a lot. highly recommended, emergency bike kits available along the path and a very good places to stop for a rest. Rode the entire trail today including the extension from the South end. Saw gators, snakes, turkey, deer, turtles, cows and an armadillo. Plenty of shade on the trail but the south extension eventually follows a set of power lines with no shade at all. Take plenty of Water if you decide to do the entire trail. Well worth it! No disrespect to the General, but this trail should be named the Gopher Tortoise, butterfly or alligator trail. We have never seen so many tortoises in one place! We also saw numerous alligator hatchlings and protective mommas and we counted 3 types of butterflies. We LOVED this trail. We got out late, but with ample shade were able to get in 40 miles without incident. Highly recommended. Bring your drinks and snacks as there are no stores. This is a well shaded trail with minimal road crossings. It's just about perfectly straight and flat. If you're looking to practice sprints and time trials this is the place to do it. A few miles past the trail head and you can be by yourself for several miles. 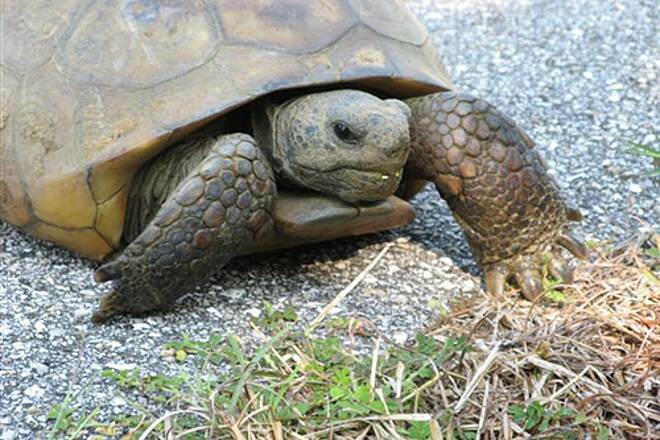 Wild life is abundant, especially the gopher tortoise. You can't go a quarter mile without seeing at least one. 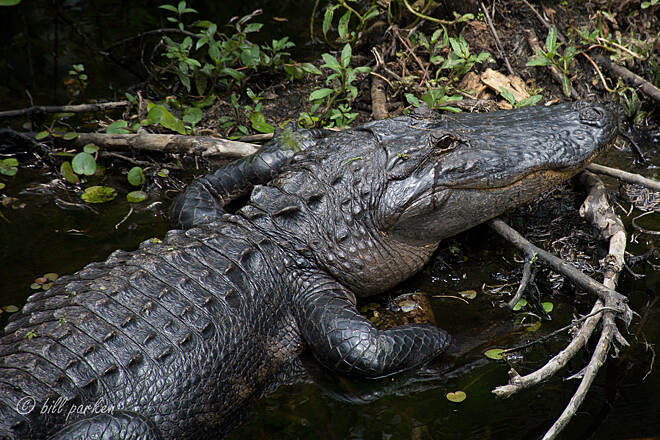 There are also plenty of birds, raccoons, snakes and a few alligators. Just respect the wild life and you shouldn't have any issues. The path also rides along farms with plenty of cows mooing at you. Keep in mind there are only three water sources; At mile 0, mile 10 and mile 29. The spigot on mile 29 produces a turbid "metal" tasting water. There are bathroom stops at these mile markers as well as an additional one on mile 20. This is one of my favorite trails to ride on because there are so few road crossings and so few other users, especially once you get away from the parking lots. This is a region in which people hunt, so be aware you will hear some gunfire from the surrounding woods and you may see hunters now and then. 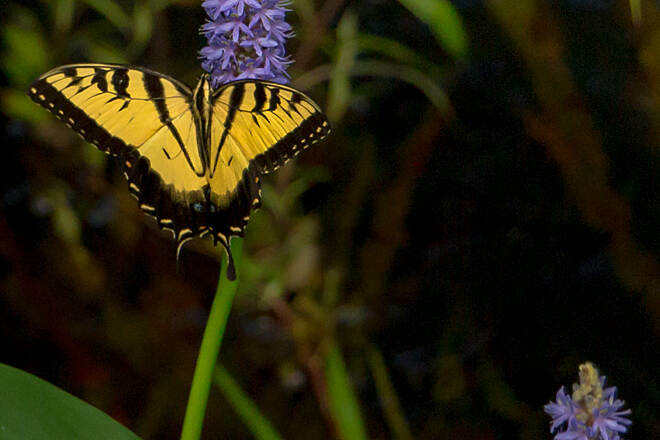 You'll see quite a bit of wildlife including gopher tortoises, alligators, birds, and butterflies. You will also see horses and cows and maybe a wild pig or snake. While there are benches along the trail there are few restrooms or water fountains so you MUST bring your own water with you. A nice feature is that this connects with the Auburndale Trail which makes the total paved length somewhere around 35 miles. This is a great trail! This paved trail is awesome for runners and cyclist. I travel for business so I haven't cycled this whole route, but the 8 miles from Polk City entrance is well maintained, scenic, and wide enough for all sorts of cyclist and pedestrian traffic. The times I've been on the trail it wasn't very busy, which is a shame, but pleasurable if you want time alone to clear your head. You'll see lots of turtles, some of them move pretty fast! Along with other birds, cattle along one side of the trail for a short length - the the occasional cool spider and web. Bring a calculator to remember the numbers of diverse wildlife you will see (and swerve out of the way of)while on the beautiful trail. Its length can make a challenge for the novice. But it is also the best place to start your first serious ride for distance. Its almost completely straight with only one gentle curve. Its safe , level , and their is always someone passing by on their journey. Having said this it is in the middle of the Green Swamp so snake and other critter awareness to include gators is a must. Look at a DISTANCE but don't TOUCH. They will and do bite. 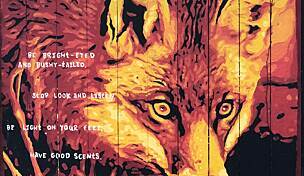 If you remember to respect the wildlife then this can be your new favorite trail. Bathrooms are at the trail heads and the trail is clearly marked with mileage. Enjoy....Enjoy...Enjoy...Remember your tax dollars helped pay for it and it was a great investment. 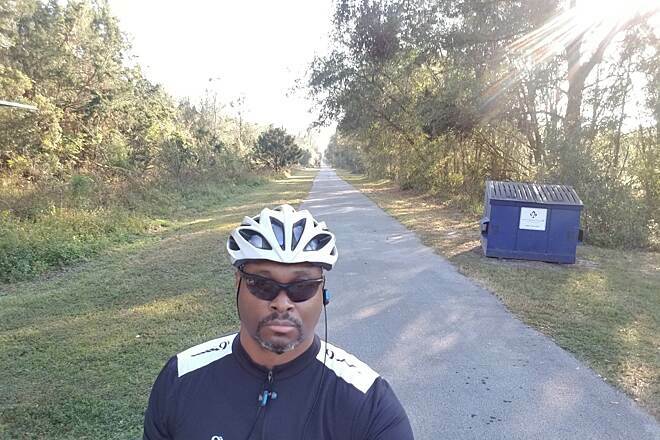 I've only been out here once, and I loved the fact I could piece together a 75 mile ride by also using the Teco trail. My biggest complaint would be some extremely rough spots on the trail itself. Tons of what are essentially potholes along either side of the trail, and lots of roots getting ready to break on through the asphalt. If it was a little smoother, it'd be a top 5 trail for me. Please do yourself a favor and bring more water than you'd anticipate needing. I brought a Camelbak and 2 24oz bottles, and had run out of water with 10 miles to go. I did a round trip on the trail which made the trip exactly 60 miles. I've used this site to find and ride multiple trails in Florida and this one is far and away my favorite. I drove all the way from St. Petersburg (hour drive each way) to give it a try and it kicks the butts of the Pinellas Trail, Suncoast Trail, Withlacoochee Trail, Gulf Blvd Ride, and the Fort Desoto Trails with all the positives from each, and almost no negatives of its own. I rode on a Sunday and saw quite a few people on it, but there were plenty of stretches where I was alone. I've ridden quite a few rides that were >= 60 miles, and I usually feel exhausted afterwards, but I feel I could've kept going another 10-20 miles without much trouble. I assume it was either the wind being in my favor or maybe I'm just getting better, but it felt really good finishing with energy still in the reserve. If you can make it out, I'd highly recommend you do so. Pros: No major road crossings, (in my case) no bad headwinds, no traffic noise of any kind, lots of wildlife to look at, and plenty of tree coverage so you don't get burned out. Cons: Quite flat, and quite straight. I really enjoy riding this trail. It is so serene just being in nature the the whole way. I have found it best to start about midway at Bay Lake Rd and head towards Mabel then back,approx 20mi. 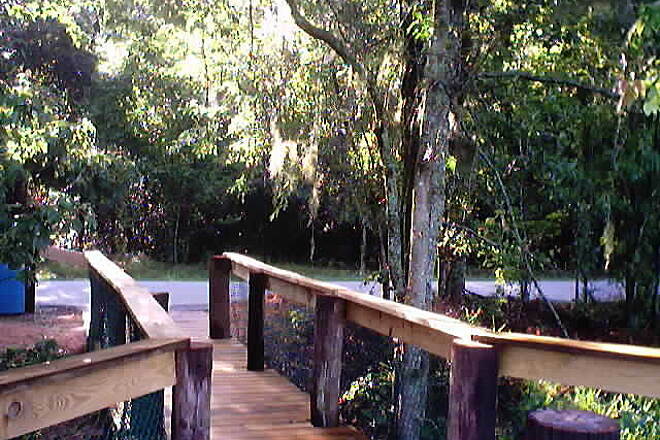 Its mostly shady and the best part about this Trail is that borders Richloam Wildlife Management Area and Green Swamp. You can go off asphalt and hit some dirt trails. Just remember to bring plenty of water and snacks. This is my dream trail. Straight, flat and no cars. The only interruption I had were squirrels being, well, squirrely. They invented the zigzag. This a great trail for anyone wanting to train for competition in my opinion. I will definitely return to this trail. My advice is to start at Mabel, where it's less crowded. I went on a Monday, and saw more people than I anticipated, especially at the south end. If you're looking for constant pedaling to get into that "groove", then this trail is for you. I did it roundtrip, which took me 4 hours. I finally got to test out my new Camelback hydration pack. So glad I got that, it was definitely needed for that long of a ride. And be sure to pack a protein bar too. Great Trail that started at Polk City and I ventured out for 15 Miles took a break and rode 15 Miles back. Trail is in excellent condition. The only questionable issue was the first 1 to 1.5 miles from Polk City has a lot of wear and bumpy especially for a Road Biker like myself. Basically had the trail to myself, not many others. Only two road crossings that were nothing from local automobile traffic. Scenery was great with several snake sightings, gators and turtles off the trail. Cross wind blocked by strong tree coverage over 80% of the 15 Miles I road. Highly recommend for a Road Biker getting into shape. 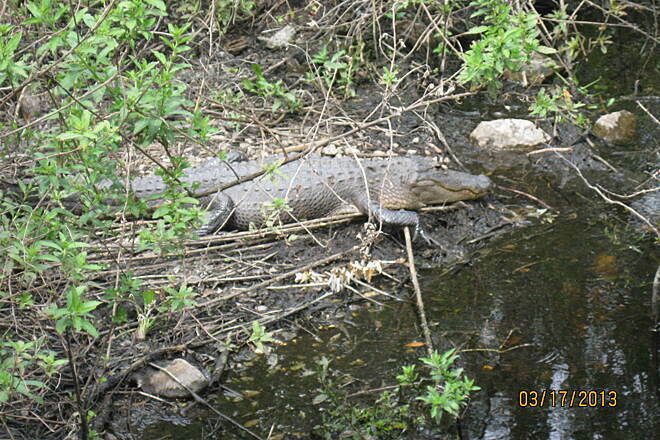 Lots of wildlife, I saw alligators large and small at the bridges, tortoises everywhere plus other smaller animals. It would have been much better if there were a few turns or undulations. I really enjoyed the ride, very quiet but i think it could become boring if you ride it often. Definitely worth a visit but you only need one gear. Wish we had one in IN! I walked only three miles and it was great. I followed the brown trail signs off 33 and found the trailhead just fine. There were a dozen bikers and only two other walkers. It was a Friday afternoon so not a lot of traffic. Might go back tomorrow afternoon. my plans were to do the entire trail. I ended up with a staple in my tire. I replaced the tube only to have another flat a few miles later (another staple that I must have missed. amateurs mistake). I made the last 20 miles with a slow leak and stopped every 4 miles or so to air up. at the ranger station I was offered a ride to the trial head another 10 miles away. I took his offer of the air compressor and a C02 cartridge instead. Rare I get a flat but it was a great ride. Call out to the ranger that lent me a hand. Hope to get out another day this week for another 60 miles. Flat and straight. No hills like we have in Michigan. Plenty of wind though. great ride. Does it mean you ride a certain trail a lot if you are on a first name basis with the Rangers and have their cell phone numbers on speed dial? My family and group of friends have been riding this trail for years now. Always something new to see, experience and enjoy. Always something blooming no matter the season. Best, most entertaining trail in Florida. You can go for speed or leisurely coast along. 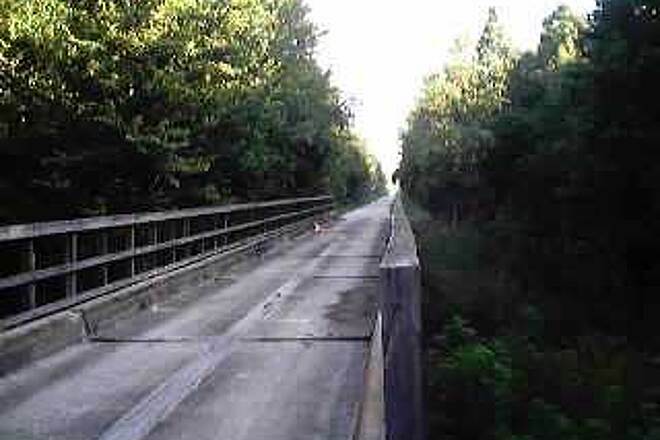 Middle bridge, 12-1/4 mile mark, usually has the large gator which some have named Billy. 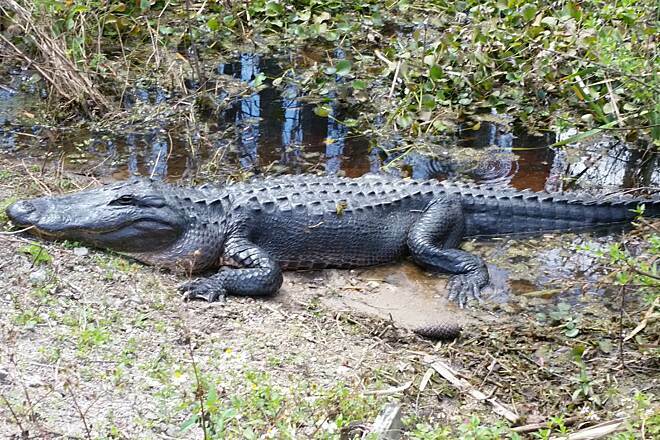 Another large 14 foot gator is at the 14-3/4 mile culvert on the West side of the trail. He also lurks in the weeds on the East side. 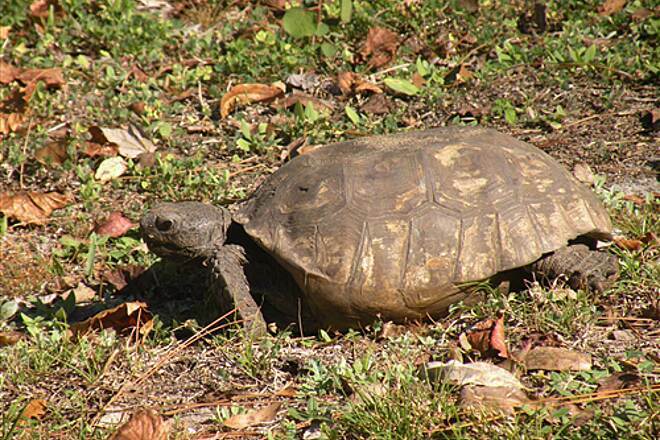 Gopher tortoise begin to be seen at about mile 2.5. Really get plentiful after Green Pond Trailhead. Alpaca ranch on East side of trail at 1-1/4 miles. Only curve, maybe 15 degrees, also named by us as Dead Man's Curve, (HAHA) is at 4-3/4 mile mark. Last 5 miles into North end of trail Mabel, FL has the only rock ledge I have ever seen in Florida on West side of Trail. Many people think the water is stagnant and filled with algae as it is quite green in certain sections. However, it is a water plant known as duckweed, which is quite prevalent in the Green Swamp and might be how it got its name. 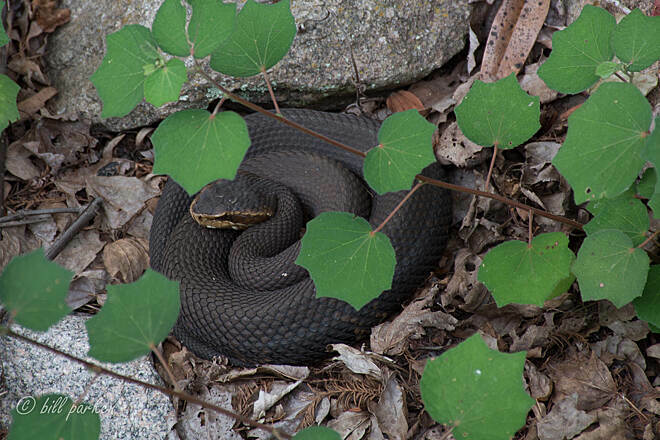 Wildlife we have seen on the trail: Snakes - Black racers, garters, diamondback rattlers, pygmy rattlers, cottonmouths, yellow fox. Gopher tortoise, box turtles, green turtles. Alpaca, deer, possum, raccoon, rabbit, cows, horses, donkeys(ranchers keep these to guard against coyotes) feral hogs, owls, hawks, eagles, gators of all sizes, armadillo, butterflies to numerous to mention each type, dragon flies, spiders...plus every type of bicycle that is made. In short, just a fun ride! My wife and our kids biked this trail the other day. It is filled with scenery, calmness and tranquility. We saw alligators, birds, numerous turtles and a deer. I highly recommend this beautiful trail. Yesterday we rode from Mabel to Polk City and back. Wildlife was abundant. This trail is perfectly straight and flat. (one small curve). 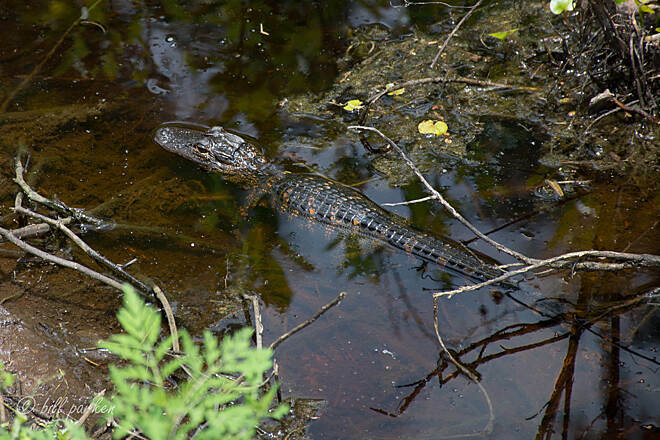 Cattle ranches, gators, turtles, sand hill cranes, deer and snakes were visible from the trail. It was hard to keep riding without taking time to admire the views. If we return to the Central Florida area this trail will be a must. What can be said about this gem in the rurals of Florida other than GREAT. First the negatives which are that the trail has only one slight curve and the remainder is almost 30 miles of a straight and flat line. My friends and I have been cycling and jogging here a few times. Most people start at the Southern tip in Pol City, Florida. Nothing wrong with that if you like to be like everyone else! 29 miles to the North is the village of Mabel, Florida. When I say village I literally mean 3 houses and Northern tip of this trail. When possible my friends and I prefer to start in Mabel as it’s what you might call the boon-docks and fun to be out where cell phone reception is a luxury. One time my friends and I parked in Mabel and were on a mission to cycle the entire trail from top to bottom and back. We did it and we saw so much wildlife. 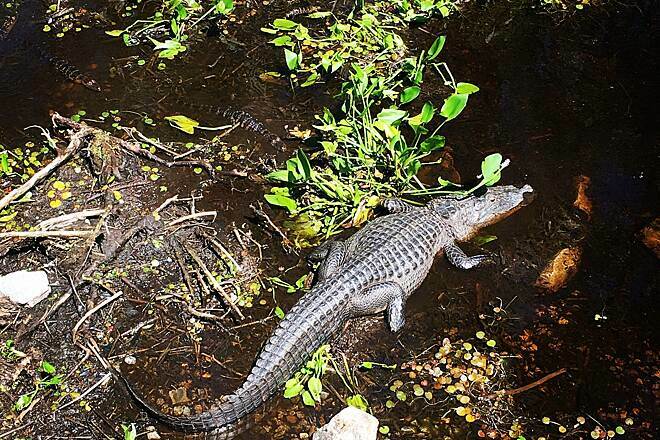 We saw gators, snakes, turtles and everything you can think of that is Florida. It was great. The trail is virtually flat so long-distance cycling is not a problem. I caution you though, going alone can be a little scary. There are no houses, very few roads that you cross, and the few roads that you do stumble upon are country roads with no sign of human life. It is not as if you cross any businesses or anything, the trail is truly out in the wilderness. For a good chunk of over 15 miles we had no cell phone reception and luckily no emergencies. If you are planning to go for the long-haul plan on the what-if emergency as I pretty much guarantee your cell phone will not work. I still love this trail. If you are having a bad day and want to escape the city come to this trail It Is peaceful and tranquil plus you get to see the real Florida wilderness. I have used this trail for running or biking for about 20 years now. 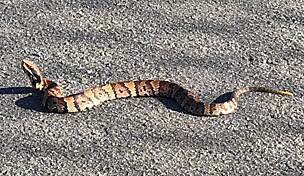 As is usual the snakes are out - saw 1 cotton mouth and 3 pigmy rattlers, but just swerved around them. One gator under one of the bridges - pretty big sucker, and several gopher turtles. It's always a nice ride, I usually take off from the green pond road trailhead and ride toward Mabel, I think this is the most scenic part with a lot of wildlife. It's always a well kept trail and there are clean bathrooms and water at this trailhead as well as picnic tables. This is a clean, well maintained trail. I cycled the round trip on a Sunday morning and saw a few dozen other people. Bring extra water. The drinking fountain and tap at the north end serves up foul smelling greenish water. The only downside is the the somewhat monotonous straight line of travel. Definitely straight and flat but well worth the trip! Tons of turtles and a few snakes but not heavily populated with riders. We started at the north end and rode 16 miles south, plus the return trip for 32 miles. We counted 19 alligators, one snake, several large birds, and a couple of neat tortoises - one laying eggs. Some of the swampiest areas were really scenic. There was lots of shade for a hot day. We will be back to do the rest of the trail. 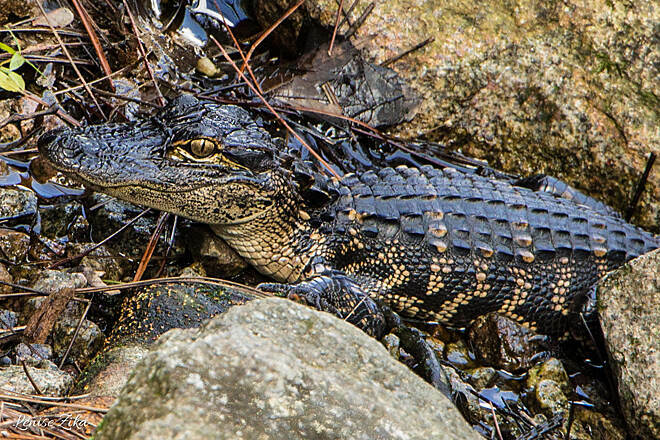 Be alert, because we came across a couple who didn't see an alligator on the edge of the trail until the last minute, crashed into each other and ended up with a lot of cuts and bruises. Take food and water, because it's pretty much you and the trail. It's a great trail but it's just one straight line, no turns. It's sad that there were not a lot of people using or riding it. I rode by myself and in the 3 hours of riding, all I saw was one person riding. granted it was a warn day when I rode it. Saw a lot of wild life but mostly turtles. I did the Green Pond to Polk City run today for the first time. Very nice and well maintained. Many gopher tortosis', several snakes, birds, turkeys, et. The trail alerts one to his senses. Smell, sounds, sights. Some other riders but still quiet enough to not spoil the ride! One snake was a cottonmouth so beware! Rode the trail between Green Pond and South Bay Trailheads & back ...no civilization except the trail, just cruising thru the Green Swamp. 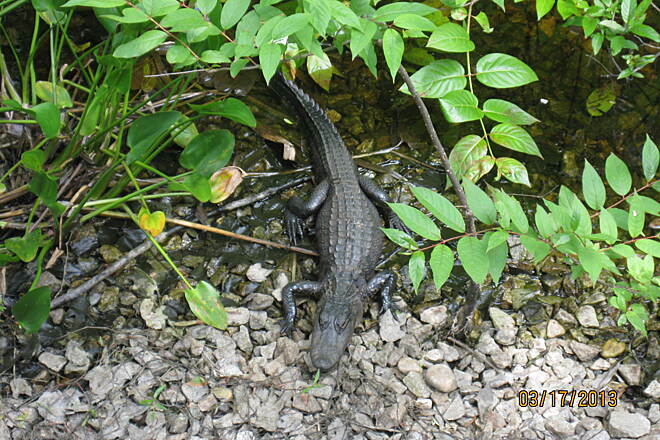 Be sure to stop at all the bridges and wildlife viewing areas, we (safely) saw many gators, snakes etc at these areas. I have ride this trail several times this year, at least 3 times a month, mostly on weekends. A lot of wild animals to see. Very flat and with shadows and places to rest. Please take a lot of water/drinks with you as well as repair/spare tubes, CO2 etc. A ride body will be ideal. Heat and high humidity can wreck havoc on your body reserves. Once I had 2 flats, run out of spares at the 14 mile marker (almost half way)on my way back. Rangers took me back to my car, forever grateful. I have ridden this trail fairly frequently, and 3 times during the month of March. My favorite part of the trail is between Green Pond Road (mm 10) and Bay Lake Road (mm 20). 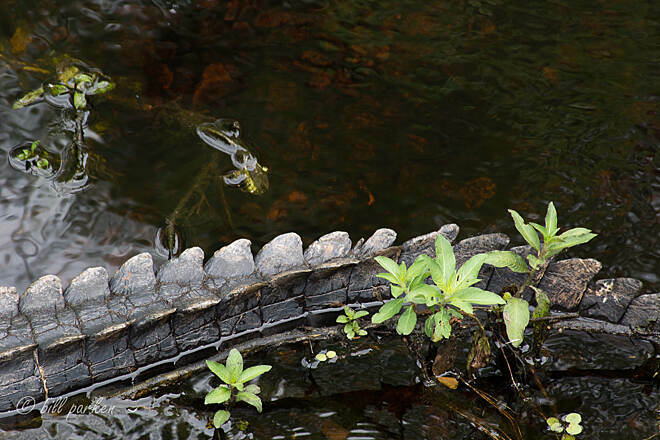 There are many 'gators this year. (Look carefully, there are lots of small ones.) I prefer to park at Green Pond because it always seems that there are more cars parked there. I occasionally park at Bay Lake for a change of pace. I have not heard of break-ins recently, and I think that Bay Lake may have become more used since they improved the facilities there. I parked at Bay Lake and rode to Mabel on Wednesday, March 11. 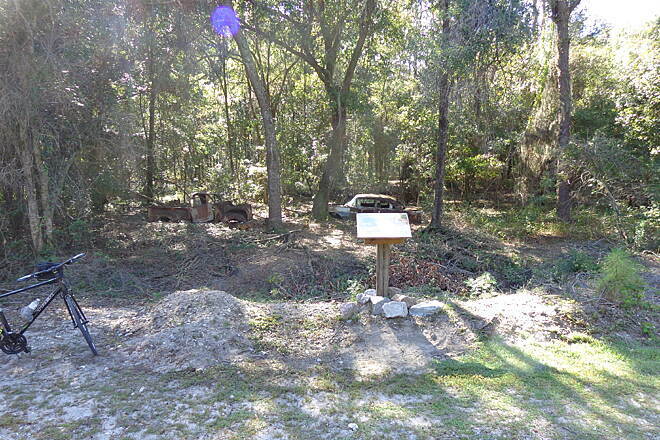 I parked in Polk City and rode the Auburndale TECO trail and the south end of the Van Fleet on March 20. Would anyone like to ride this trail with me on this coming Wednesday? I am concerned about the crime and car breakups reports. Is this still a problem? We rode this trail starting as SR 50 south into Auberndale. No signs of construction, so I guess that's all finished. Rode during the end of December 2014 and the weather was perfect. Yes, this trail is straight and flat, but if it's nature you wish to be in then you came to the right trail. We saw otters, deer, and numerous species of birds. Oh yes, the suicidal squirrels are there, too. This trail is well maintained throughout, but really needs more potable water areas. It was winter, so insects were not an issue. If you ride this trail, make sure you carry ample water and food with you. This trail is in a very natural setting. On my 102 mile bike ride, we saw otters, deer, and a lot of bird activities. Yes, the trail is straight, flat and long, but it is nice and peaceful. The trail could definitely use additional potable water services. If you ride this trail makes sure you take plenty of drinking water and food. If you want to go fast with your eyes closed, this might be the trail for you, but after our first trip, we never went back. Mosquitoes, even in winter, were bad, both sides of the trail was a continuous tract of thick bushes, not only boring, but there was no place to stop, and the trail went straight, straight, straight! The Withlacoochee trail is pretty straight too, but much, much nicer. Biked the first 10 miles from the Polk City end. Nicely maintained paved trail. Excellent for geocaching. Not too busy on a cool (50s) winter day. Can't say much that hasn't already been said..
First time EVER riding in Florida! This place is great. Read a few reviews and most people are pretty accurate. It's just a long flat surface that is good for a long or short ride. The only wildlife I saw today were the turtles that everyone seems to see. They were literally about a foot away from the path(on average) I think I saw 7 or 8 in total. Not the most interesting creature, but cool none the less. We thoroughly enjoyed the trail once we finally found our way to the Green Pond Road trailhead. We made several attempts to find the Mabel trailhead but were unsuccessful. 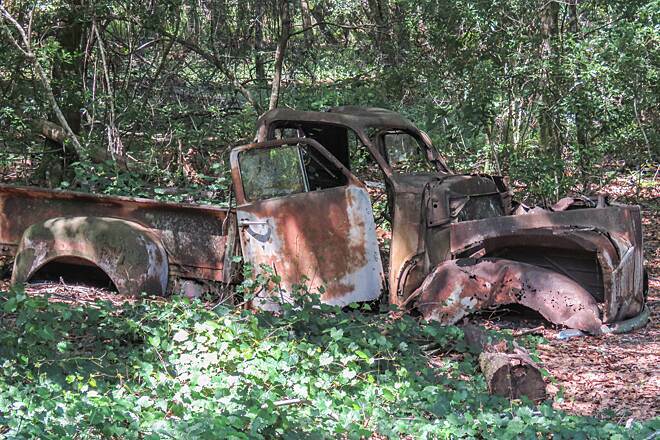 We even asked approximately ten locals where we could find the Van Fleet trail. One of the locals was on a bicycle, said he had lived there for ten years, still no luck. He had never heard of the trail. We had no trouble finding the Green Pond Rd. trailhead...it is clearly marked thank goodness. We plan on revisiting the trail....wish there were better directions to the Mabel trailhead because it is much closer for us. Enjoy the Va Fleet trail...we did. I want to report criminal activity along this wonderful treasure, with the hope that further trouble may be hindered. I was made aware of a crime spree 3 weeks ago by a resident living near the Greenpond parking lot, which involves the breaking out of passenger car windows and ransacking of vehicles. This has been a recurring problem, and may have involved other trail points as well. In addition, I have encountered 4 motorized vehicles on separate occasions, riding the trail in my past 3 trips. PLEASE NOTIFY RANGERS/POLICE OF EACH INCIDENCE of unauthorized motor use, as this poses a danger to ALL trailusers , even if it appears they cannot be apprehended. We need to monitor the number of occurrences, to see if there is a trend, and also to see if there is any relation to the crimes. On May 13 approx 1 30 pm I was nearly killed by a white, extended cab pickup truck travelling at excessive speed along the trail. I was forced off the trail to avoid being run down. I made a 911 call and police report, and have learned that he is a fleeing felon with a warrant for his arrest. He was being chased by police and cut through to evade capture. He is still on the loose. Anyone with info PLEASE CALL Lake County Sheriff 352-343-2101, case number 140075751. 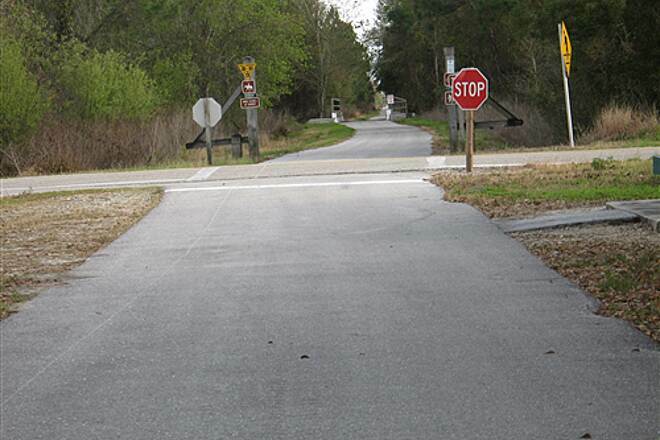 We must also urge FL Fish/Wildlife to see that trail access by motor vehicles is blocked using barriers at EVERY trail crossing in the State, along with heavy ENFORCED fines for unauthorized motor vehicle use of OUR trails. Also watch for my petition to the Florida FWS ON CHANGE.ORG asking for these changes to make our trails safer. I ride this trail about once a week. It is great so i can get some distance and work on my speed. Very flat and straight. Honestly it is very repetitive and gets boring after a while if you aren't listening to something, just lots of woods, ranches and open fields. But don't get me wrong, very beautiful, expansive, tortoises, birds, snakes, bunnies, cows, horses, i think emus or llamas. Great ride. Rode this trail 11.2 miles in and then back yesterday. Delightful trail with a very I crowded feel. Enough people to feel comfortable but periods of solitude. Saw many beautiful birds, turtles etc. Started the ride in Polk City but may start from other end next time. Van Fleet - What a Trail - What a Man! My friends and I ride this trail at least once a week. Whenever someone who has never ridden the trail joins us, we caution them about "Dead Man's Curve" which is just before the 5 mile mark. It is a slow gradual curve of about 15 degrees over 200 yards and has led to many jovial moments and comments. 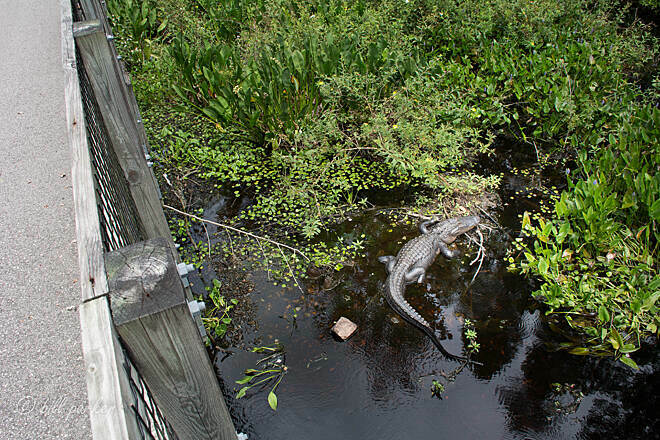 At The Bridges, which are three bridges from mile 12 to mile 12.5, we observe alligators at each bridge. Unfortunately, too many people have thrown them food and they have become quite curious of riders as they expect more goodies to be thrown to them. DO NOT DO SO! 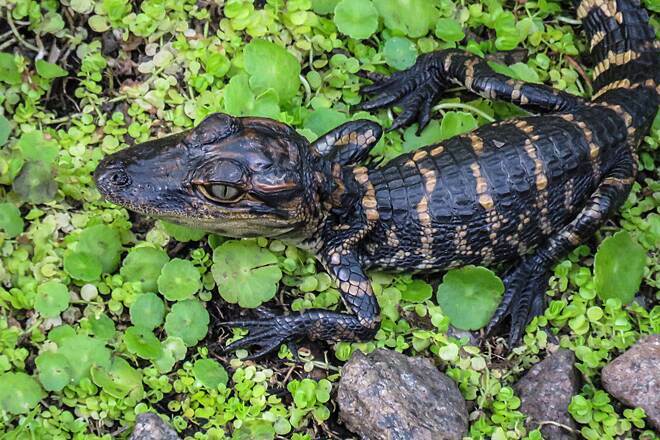 It is a very dangerous thing to have gators associate humans with food. 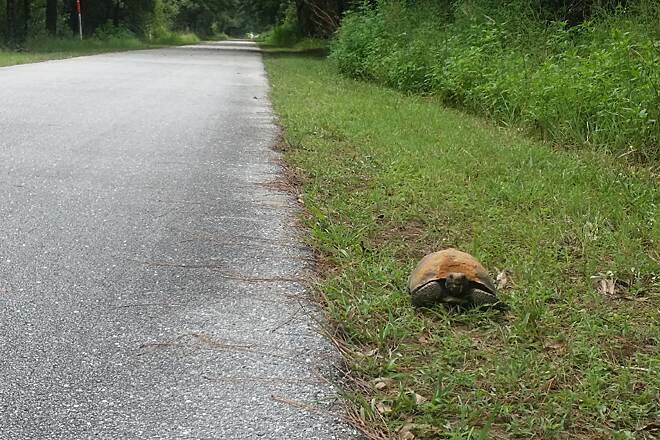 Gopher tortoises are starting to really become prevalent on the trail which means the snakes will not be far behind. Pygmy rattlers are the worst of the lot. Owls are usually spotted during the first 2 miles from Polk City. Armadillo are not as numerous, but can be quite suicidal as they dart in front of your bike. Same with squirrels. 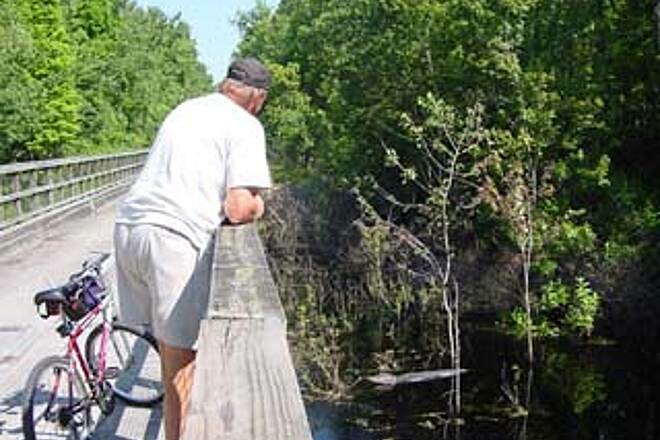 If you like solitude, listening to nature, observing flora and fauna of Central Florida, this trail is an excitement any time, any season. Oh, the butterflies are now starting to appear. Be prepared to see lots of them as their numbers will increase steadily from now through July! Some might even hit you in the face. Or as people in my group say, "They give us butterfly kisses. Literally!" My husband and I ride the Van Fleet almost exclusively. 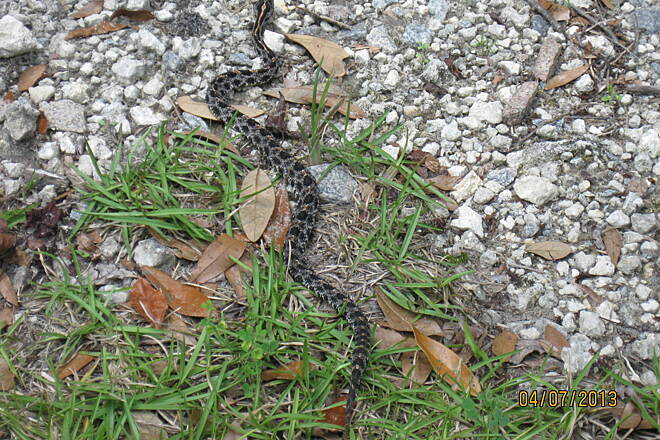 We love all the wildlife including Diamondback Rattlers.....well maybe not the snakes!! We see new animals almost every time we ride.....alpacas, burros, armadillos, etc. You can ride for hours and not have to worry about traffic. It's a great place for riders to train. We usually get on at Green Pond Rd., ride south and do a 2 hour round trip. Try it, you'll love it! My wife and I and a friend rode 12 miles of the north end of the General James A. Van Fleet yesterday. We got a late start (11:00AM) so we only saw two deer. However about 2 miles south of the Bay Lake parking lot my wife got a flat tire on her rear tire which is no big deal because we both carry spare tire/tube equipment. After replacing the tube and reinflating, ten minutes later and another couple miles south the tire/tube went flat again. Deep concern set in because we only had one CO2 cartridge left. I refilled the tire/tube with it and off we went. Unfortunately after another 10 minutes and 2 miles it went flat again. We were at that point dead in the water. I haven't pulled the tire off the rim yet but my hunch is a structural failure with an intruding spoke. I would like to give a huge thank you to (Russ/Ross) who operates a state maintenance truck on the GJAVF trail. The plan was for me to head back North to get our own car, then drive back down south to the Bay Lake parking lot while my wife walked her bike North to the Bay Lake parking lot. HOWEVER, about half way back I ran into Russ/Ross. I explained the situation and he said no problem, he would drive south, get my wife and drive her and her bike back 12 miles all the way to the north "Mabel" parking lot where are car was, which he did. Russ/Ross, thank you 100 times, if not for you, she would probably still be walking. Yes it is EXTREMELY isolated. There are NO OTHER trails like it in Florida. Within minutes of leaving the parking lot, it felt like we were in the middle of nowhere, and we were. Good clean asphalt pavement that is totally straight with very little grade. If you're a road bike racer or training for a TRI, this is the trail for you because you can really get it on speed wise. Decent shade in most areas. No bugs in the winter but I'm sure in the summer they're horrendous! NO water at all except at the North and South ends so you MUST bring your own water and food. This may be the best trail in Florida. We're new riders so we completed it in two phases on different weekends starting in the south and up north in Mabel. It has it all, good pavement, shade, scenery, gators, snakes and turtles. A truly excellent trail. Well maintained and very scenic. I saw alligators, Gopher tortoises and deer and the majority of the trail is well shaded. I felt like I had stepped back in time. I came with three other riders to check out this trail. We drove 2 1/2 hours and we were not disappointed. We started at Polk City and rode to the end and back. It was a beautiful trail and very well kept. The highlight of this trail for us was all the shade and no wind. 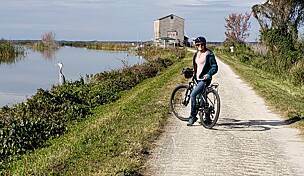 We are use to riding the Lake Okeechobee Scenic Trail which is in direct sunlight and usually windy. We thought we were riding in heaven. I enjoyed the remoteness of the trail and seeing armadilos, rabbits, skinks, a snake, butterflies and lots of tortoises. We plan on returning to ride it again someday with some more L.O.S.T riders. Had a great bike ride from Mabel (at the north end) to Bay Lake trail head. Saw lots of turtles, snakes and a red shoulder hawk. Saw one couple on bikes and a work crew. The rest was all nature. A good path to see the REAL Florida. Most of the path was shady, but had LOTS of mosquitoes! Got a flat tire and had to walk 2 miles back to the car. It was a nice walk, but very hot. Take LOTS of water. Enjoy! I rode this trail from Polk City along its entire length up to SR50 and back today, which was a total of 58 miles. I’ll tell you one thing, this Trail is out there! 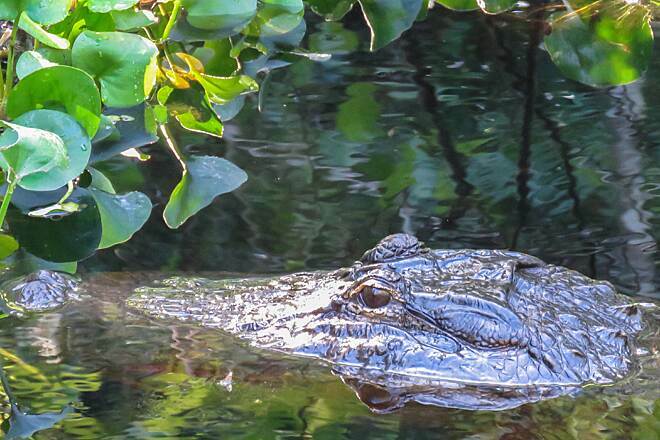 Starting from the Polk City Trailhead, you’re well into the Florida backwoods and then the swamp in short order. Don't miss the Lama Farm on the right heading out of Polk. You'll do a double take, as I did. Otherwise, it’s completely unpopulated above Green Pond Road and there are even very limited cross roads to hold you up and most of those are trails through Green Swamp for the mudders. That remoteness also means that there’s no places to get a sandwich or a water refill or help with a flat, so you better be carrying everything you need. I carried 3 liters of water and a couple packs of cheese crackers and was fine. If you want to take more and make a longer day of it, there are many picnic tables along the way and a number of nature trails to explore. Another thing to keep in mind is that you’re in the swamp, sharing it with a lot of nasty biting insects during most of the year. Take some good bug repellent; I use Ben’s 100% deet and had no problems. 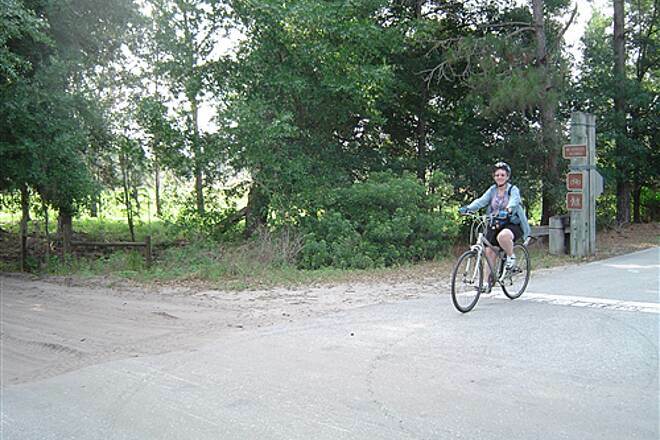 Overall, the Van Fleet is a very enjoyable, clean paved trail with lots of wildlife. It’s well worth the trip from Tampa to Polk City to ride this trail. This is generally my weekend ride. There are very few people, mainly cyclist. There are almost no cross-roads (to have to unclip from your peddles) and lots of wildlife to keep you interested. 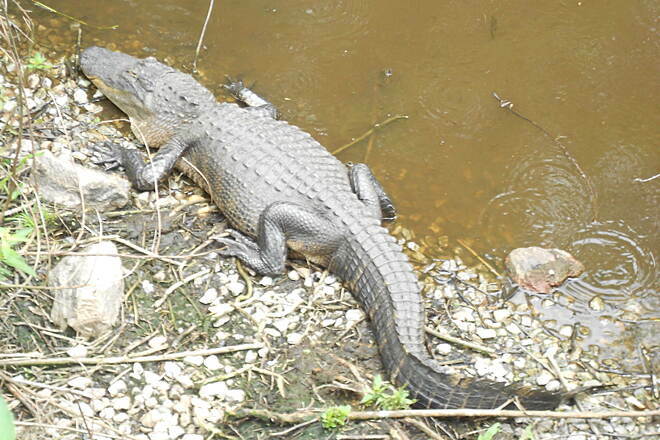 Today I saw lots of turtles, a fox, some deer, a baby gator (about 3 feet long) and a huge alligator (about 12 feet long). There are no turns and a long, flat nicely paved roadway. It's a about an hour from my house but the benefit of not having to ride in traffic offsets the drive to the trail. This is a great trail and I highly recommend it. Prior to driving to the trail, I visited floridastateparks.org/vanfleet/. The website says that the "trail is blocked at the Bay Lake Road Parking area". I parked at Green Pond trailhead and rode north to mile marker 24.5 and back (29 mile round trip). 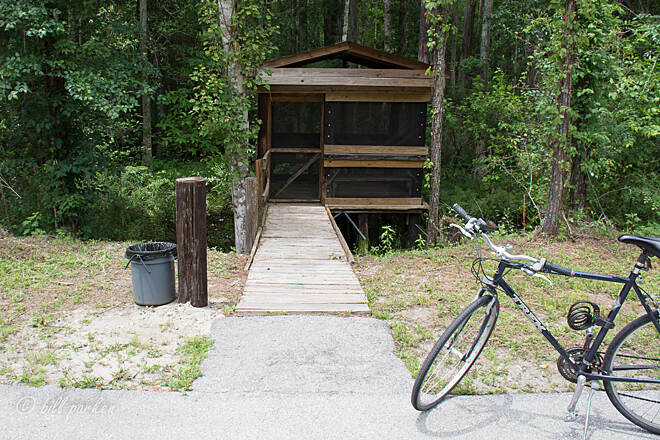 The trail was NOT blocked at Bay Lake Road, although there was a barricade at the entrance to the new parking area. 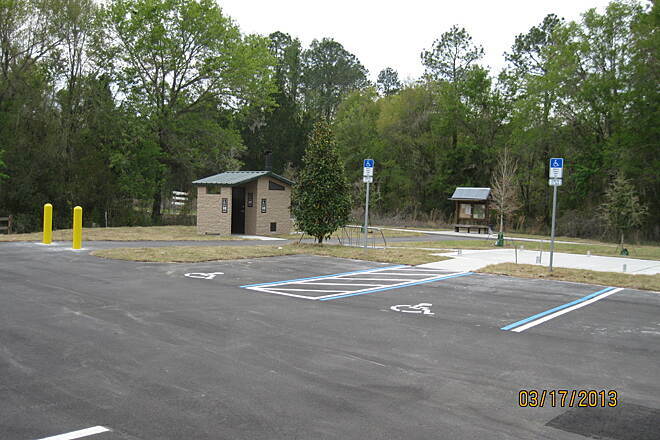 The trailhead ammenities at Bay Lake Road are very nice; paved and striped parking and a unisex restroom. I saw two gators, 2 raccoons, one snake (too quick to identify) gopher tortoises (too many to count) hundreds of butterflies. 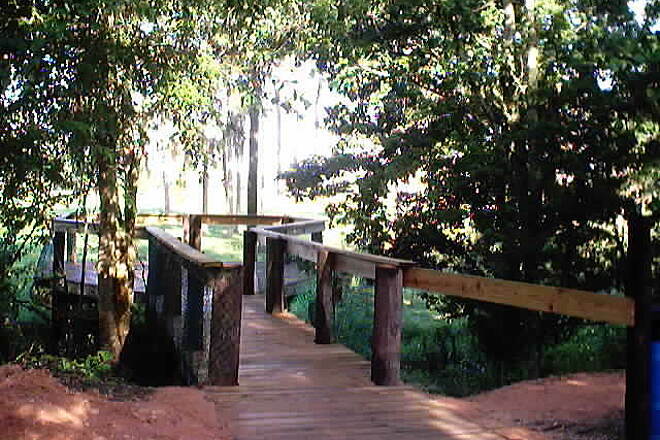 This is one of my favorite trails in Central Florida (although it is about an hour drive from my home in Orlando). What a great Park and Trail head! Today was a Chamber of Commerce kind of day, so that made this ride even more special. Every one on the trail was nice and the trail is in absolute perfect condition. Although we only rode 12 miles, we will be back however many times it takes to see the entire 29 miles. It took me 3 20 mile rides to finally complete this trail. (10 up 10 down). I love the trees they provide plenty of shade if you ride during the day. However if you're like myself and ride in the PM. When the sun begins to go down; it gets pitch black real fast! It becomes a scene of a horror movie with all the wildlife moving around in the bushes. I like the bridges, canals, wildlife. Be careful, there are poisonous snakes and spiders on the tree branches. Overall its great! Started in Polk City, and rode north. Beautiful ride, just Florida woods and pastures and a straight road. Plenty of rest spots with benches. Country quiet. The wildlife makes this trail (they say) but I saw only a few turtles, deer, big birds, a snake (dead/alive?). The flora is about the same as you find on most FL trails; love the live oaks & pines. To me it became pretty monotonous heading straight as an arrow on a smooth flat surface (no hills, no curves). Having a companion rider along would have helped break up the routine. You could put it on cruise control & take a nap. Bring your own water & nourishment, you'll find none along the way (except water at Green Pond TH). Empty your bladder before you depart. Don't plan on using a cell phone; signal is poor. There is little shade to be had--didn't matter much in Dec but in July or August it may. This wouldn't be a "destination trail" for me but if you're in the area it's worth checking out. This trail is awesome. It is 29 miles of flat, straight pavement. Great ride for any age. This is an isolated trail, though safe, always ride with someone. Facilities are limited, so take water and food (sunscreen). Plenty of picnic tables with covers overhead. Fantastic wildlife viewing, take camera. I have seen deer, gators, snakes, turtles, raccoons, squirrels, amardillos, wild pigs & boars, coyotes, bear, vultures, eagles, hawks, owls, and one escaped pet monkey (for real!). If you like nature, give yourself time to take it all in. You won't be disappointed. I have rode some of the best trails in the state of Floirda and this is my favorite. Previous reviews are right on the money. The only thing I will caution you on is that I have ridden the trail twice and encountered poisonous snakes both times. Both times they were across the trail and did not move. Remember this trail is REMOTE! There is no medical care readily available. Great ride, be careful! Can you say no turns. Nice ride if you have trouble with turns, because there is only one. Plenty of animals, on my round trip I was able to see one alligator crossing the trail two nice black snakes also crossing the trail and about 24 turtles (too funny how some react when you go by). Best encounter was with an owl sitting on a bridge post not more than 15' from where I stopped. Nice trail but man is it straight. I rode this trail on April 25, 2011. Nice trail, very quiet and remote. Saw more wildlife than people. Also, very hot in the middle of the day. Bring plenty of water. 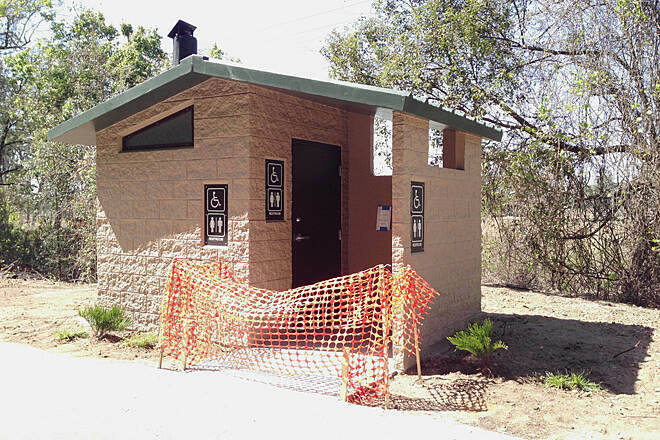 Water and bathrooms are available at the Mabel and the Green Pond Trailheads. Lots of critters to see; alligators, otters, turtles, vultures, and suicidal squirrels. You know, the kind that run at moving wheels. Trail is straight and level as stated in the description. There is a connector that goes to the Teco - Auburndale Trail. It's almost 7 miles South to the trailhead at the Lake Myrtle Sports complex and Denton Ave. Both trails are worth the ride. WOW! What an amazing, wonderful gift! 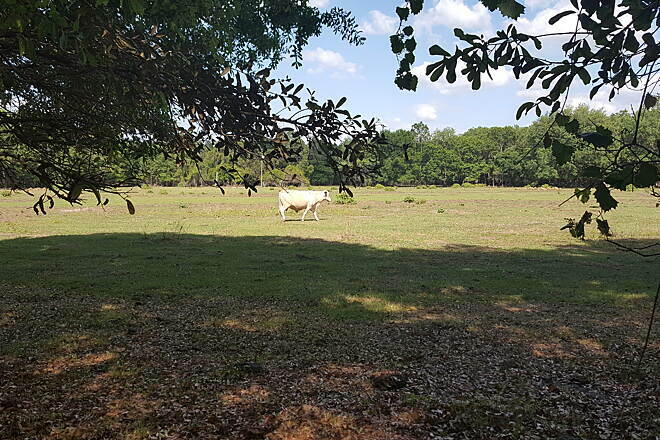 We rode the trail and were thrilled to experience the cypress groves, swamp lands, grazing pastures, gopher tortoises, snakes, alligators, llamas (or maybe alpacas), birds, butterflies, wildflowers, swamp flowers, etc etc etc. Lots of benches to take a break. No cars at cross roads. This is a lightly used trail compared to others we have been on. People were all very friendly - no obnoxious guys flying by at 30MPH, snarling at you to get out of the way. As stated, bring food and water, bug spray, sun block and a hat. The sun is strong at high noon, but the trees are tall and provide shade in the early morning and late afternoon. We found the 5 miles north of Green Pond Road to be the prettiest. I rode the trail from north to south on March 1st. It was the 8th trail on my quest of 10 Florida trails. I was the most remote of all10. 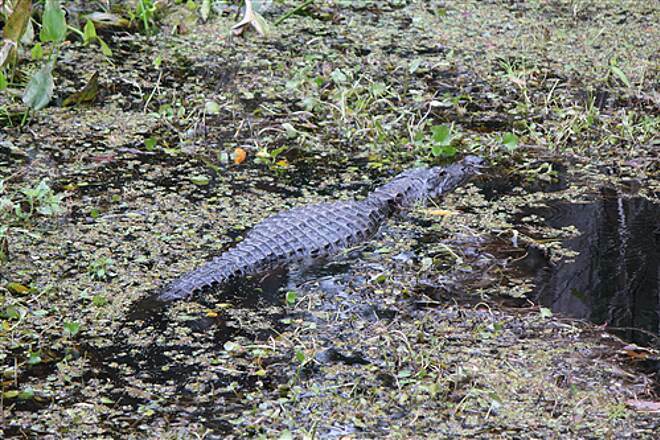 I saw seven alligators along with a couple of snakes lost of birds and turtles. I really prefer trails that are in a more rural setting. The 29 miles are an ideal distance for a leisurely ride before lunch. Trailhead direction were right on. The best part of the trail for us was the northern 19 miles. We saw 7 alligators, 2 bull snakes and a flock of vultures eating a dead cow within 30 feet of the trail. I biked this trail 2 years ago and only saw a couple river otter. It is boringly straight, but makes up for it with all the wildlife to see. Van Fleet trail is spectacular! My wife and I rode the section from Bay Lake to Green Pond and back, a ride of 20 miles round trip. This portion of the trail is about as remote as you can get in Florida. We saw gators, armadillos, tortoises and one very wise owl. 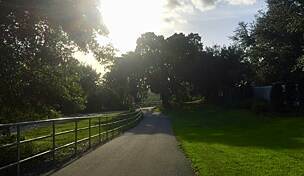 The scenery is Florida wetlands - enjoyed the series of bridges in the middle. The trail is straight ahead the entire time, but the scenery alongside is ever changing and wonderful. We didn't see the rest of the trail, but we will return to do so. We parked at the Bay Lake trailhead, which isn't very well marked, so bring a good map. We had no problems there. The construction is complete on the Van Fleet Trail! 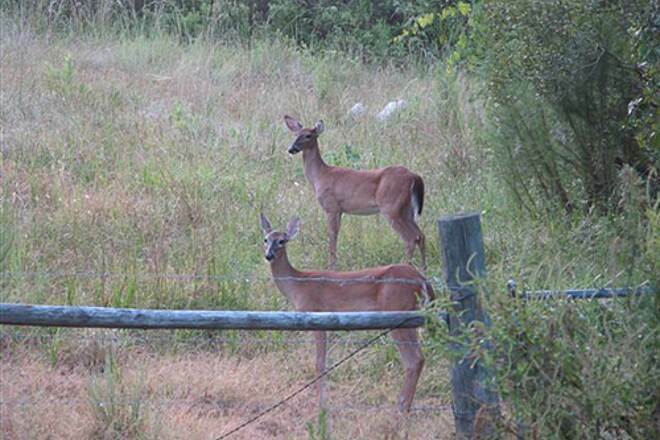 Keep your eyes open and you will have wonderful wildlife viewing opportunities. We have seen fox squirrels, pygmy rattlesnakes, deer, alligators (with babies), otters, gopher tortoises and various snakes. The trail is flat and straight which can be a bit dull, but the critters and not having to dodge traffic makes up for that. My wife and I rode this trail today and it is an interesting trail with a lot of opportunities to see the varied wild life of the swamp. However, I would not recommend parking at the Green Pond road trail head. When we returned from our ride, our car had been broken into. The officer who came to investigate the incident commented it happened about once a month at that location. So, by all means, ride the trail. You will not be disappointed. But, park at the Polk City trail head or the Mabel trail head and, hopefully, you won't have the unpleasant surprise at the end of your ride like we did. Looks like all the grading and road base construction is complete, and they're waiting for a break in the weather to start paving in Polk City's piece of the link. I'm told the state is in charge of connecting the new link to the south terminus of the Van Fleet, and they are planning to route the trail around the west boundary of the existing parking lot at the terminus. "This is THE trail to ride when you want to get away from it all. Lots of wildlife, covered benches and soooo quiet. Watch-out for the numerous snakes, some are poisonous. Bring your own water." 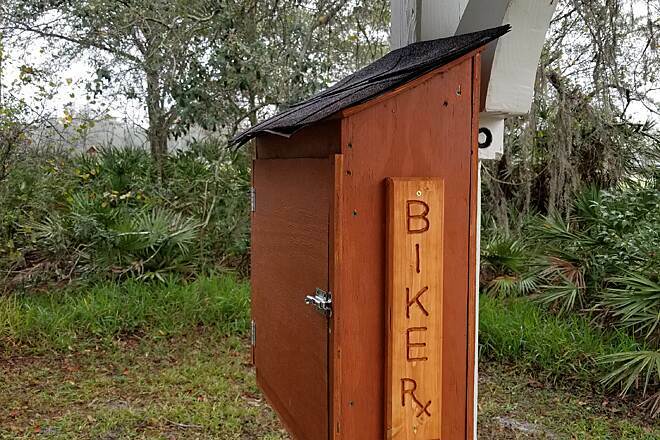 Polk City has received funding to build the connection between the north end of the Auburndale-TECO trail and the Polk City trail head of the General Van Fleet Trail. Both trails are built on a contigious railway corridor. The construction area is about a mile to a mile and a half in length. It should pass by mostly low density residential subdivisions." "YES!! 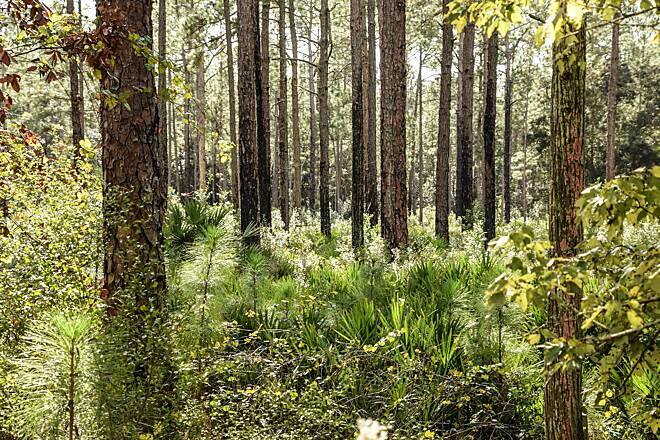 This trail is worth extending to help preserve the Real rural FL. We traveled from OH & were not disappointed (except for the urban sprawl,which is getting close to the north end). We saw Red Tail Fox, Armadillo, and lots of Cooters! And surprisingly there is lots of shade." 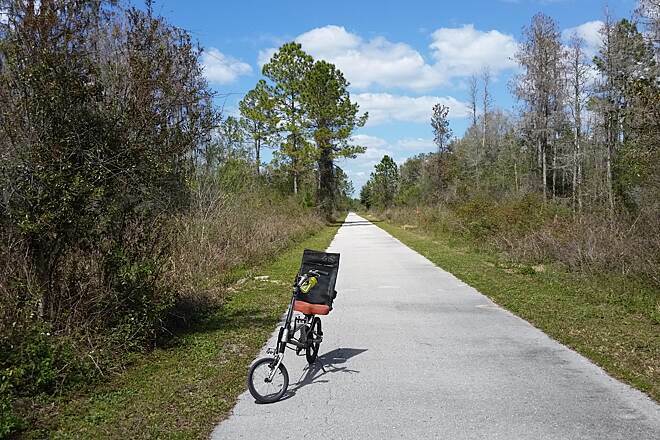 POLK CITY -- The trek along the Van Fleet State Trail would stretch more than a mile into Auburndale if city officials have their way. City officials are envisioning turning a stretch of undeveloped land with overgrown bushes and trees on Berkley Road and State Road 33 into a 5,550foot-long paved trail. 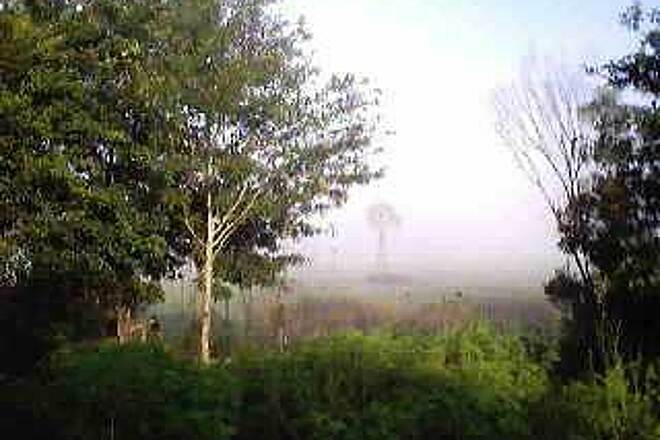 But that vision goes beyond a simple trail were people could ride bicycles, jog or enjoy the wildlife walk. ""We envision a park atmosphere with benches, vegetation and lighting,"" City Planner Gene Kniffen said. ""We are still in the planning stages, but it will be pretty neat."" 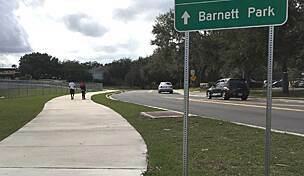 The trailhead of the Van Fleet State Trail extension would be on Berkley Road and would connect to Daniels Road, a dirt road in Auburndale. 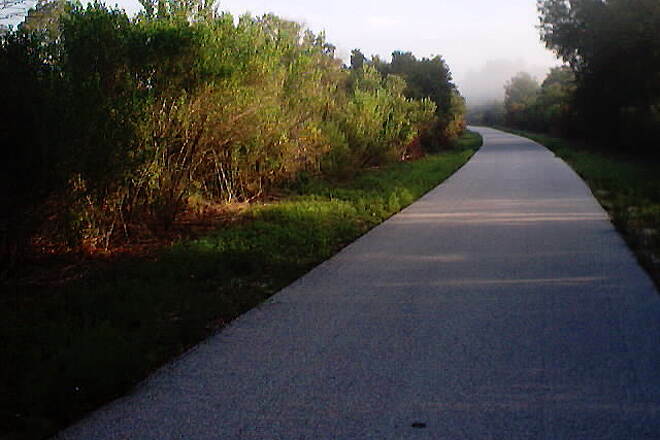 That would link the Van Fleet State Trail to the TECO-Auburndale Trail. 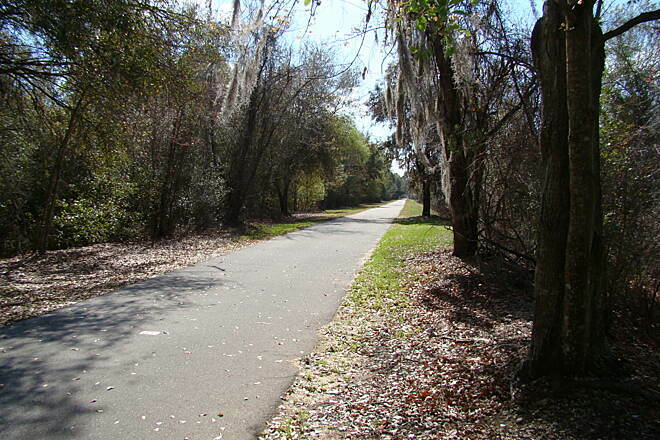 The Van Fleet Trail runs for 29 miles between Polk City and State Road 50 in Sumter County. 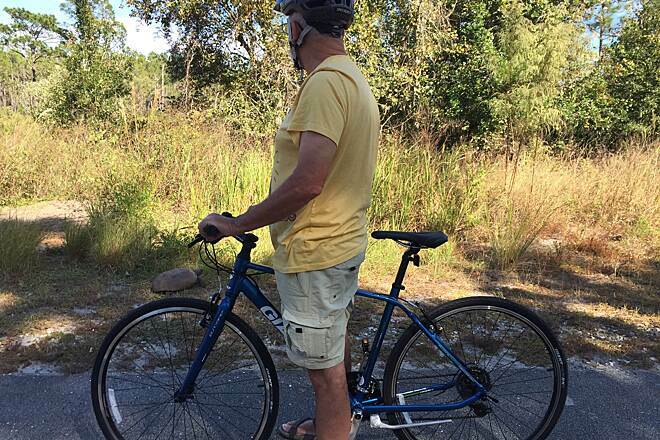 And Auburndale has been in talks with Polk City officials about extending own TECO-Auburndale Trail to the Van Fleet State Trail. Denico said the Van Fleet extension is worth the time, money and effort because people will use it. As an example, she pointed to a horseshoe walking nature trail about mile from the Van Fleet Trail that brings visitors from as far as Panama City and Miami, Vice Mayor Chris Denico said. 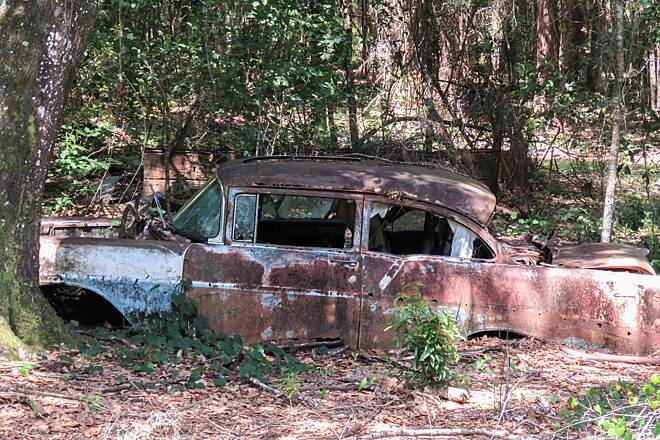 ""You know when you see the car tags how long people have traveled to use it,"" Denico said. ""That's why we know this project is going to be a great addition. It will be used."" The trail extension may take two or three years to complete. The project's first phase is estimated to cost the city about $300,000 to $400,000. That phase would consist of clearing the area and paving a strip in the middle. Kniffen said he hopes that work can be completed by the fall of 2007, if the city can get the money through grants and other sources. The second phase would be planting trees and flowers, putting in benches and lighting. There is no cost estimate for this phase. On Tuesday, the Planning and Zoning Board reviewed a survey of the trail plan and is recommending that the City Council seek state funding and grants to pursue the project. The city would most likely seek funds from the Department of Environmental Protection and the Department of Transportation, Kniffen said. The council is expected to make a decision at its next meeting Tuesday about whether to approve construction and about seeking funding for Phase 1. Denico wants to make sure the city's natural flora and fauna doesn't get trampled with construction. ""It's going to be a great addition to the community,"" Denico said. ""But we want to preserve its natural beauty."" Iza Montalvo can be reached at iza.montalvo@theledger or 863-401-6967." "This is one of the most remote paved trails I have ever been on. I remember only crossing 3 roads in 30 miles. Except for Polk City, there are no places to eat on or near this trail. 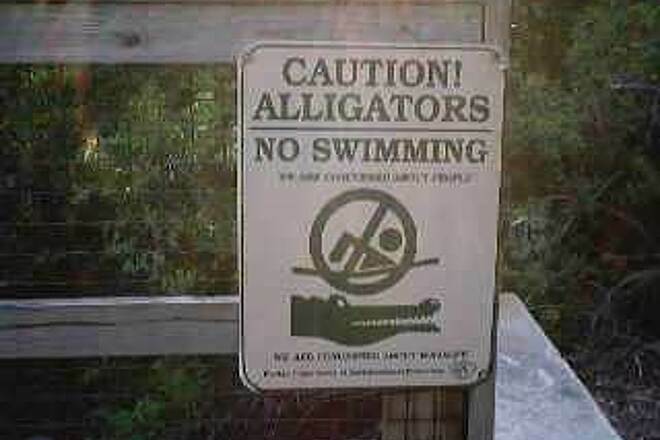 Watch for alligators and wild hogs. 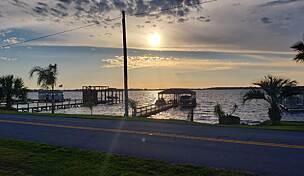 If you are looking for a place to get away from it all in Central Florida, this is it. " "I rode 15 miles out from the Mabel trailhead. It's a beautiful ride. I saw lots of wildlife later in the day. Around 1:00 p.m. I saw two deer about 100 yards up the trail. They ran alongside the trail for about a quater mile as we rode behind them. Later I rode up on a 10 foot alligator that was sunning about 6 feet alongside the trail. When my friend rode up along side of it after I already passed, the gator jumped off the trail side and dove into the swamp! It was a fantastic site. We also saw no less then 20 turtles, and several snakes. Don't let my review scare you -- all these critters run from you. They hear you coming before you see them. This is an excellent trail. Ride it and take in the beauty and leave nothing but great memories." "This is an excellent trail for heads-down-mindless-cardio-pedaling. If you want to get a good workout in this is a great trail. There's good shade, it's a long, flat, and straight-as-an-arrow trail with few road crossings. 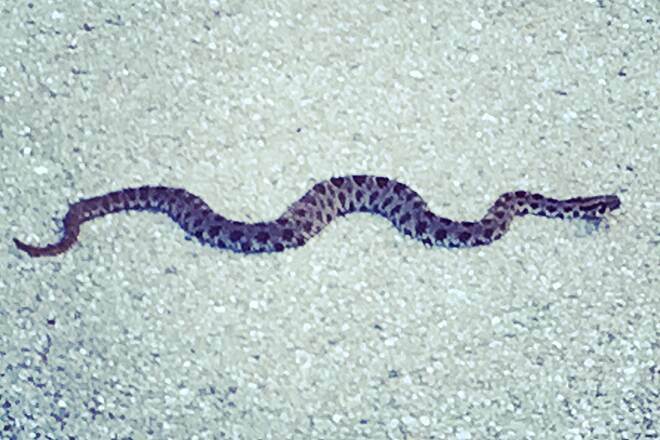 Watch out for small alligators, and snakes on the trail. Don't worry -- they'll run first!" 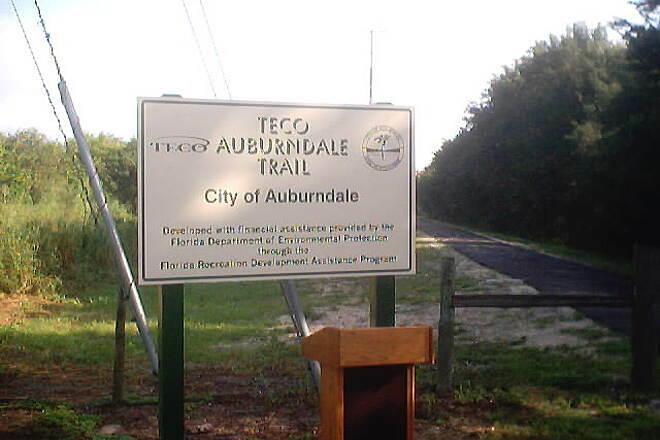 "The Auburndale-TECO Trail is now officially open to the public. Expect plenty of shade in the morning, and full sun from mid-day to late afternoon. Bring water with you. The trail is within a powerline-utility corridor. Parking is available at the Lake Myrtle Road Trailhead and the Lake Mrytle Park Soccer Fields. The trail may be accessed from Braddock Road, Pace Road and Mt. Olive Road. The trail has a gentle upward slope from Braddock Road to Pace Road, less of a slope from Pace to Mt. Olive Road. There is a convience store at Lake Myrtle Road and Berkley Road." 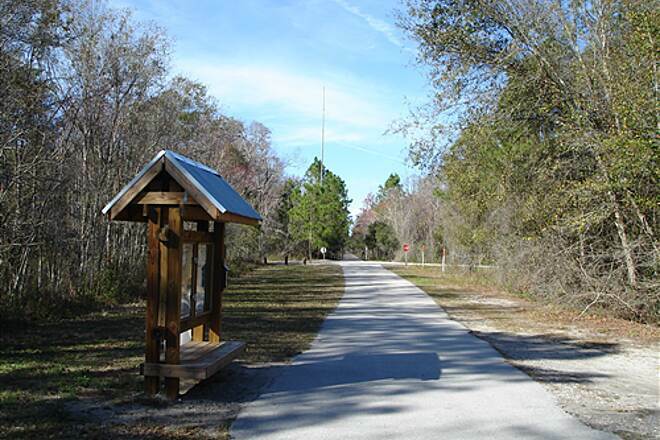 "The Florida Office of Greenways and Trails has assumed management of the Van Fleet State Trail this year. 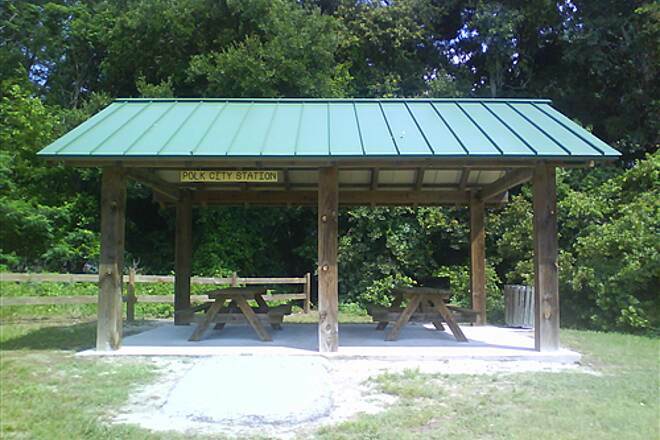 The Polk City Trailhead has been upgraded with the additon of a picnic shelter and paved ADA handicapped parking. The City of Auburndale has been paving. 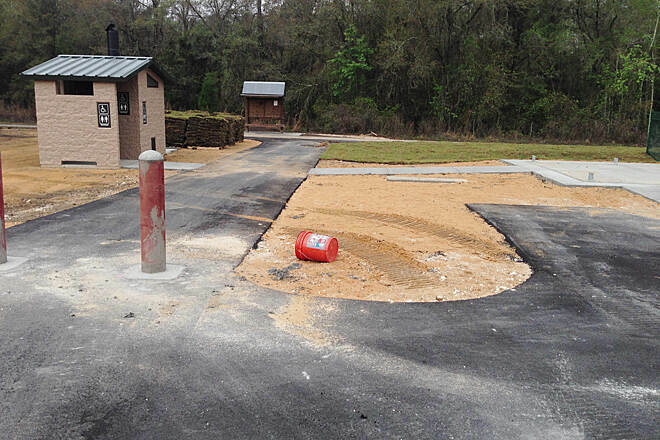 First, a parking lot has been completed for the Lake Myrtle Road Trailhead, it is open to the public. 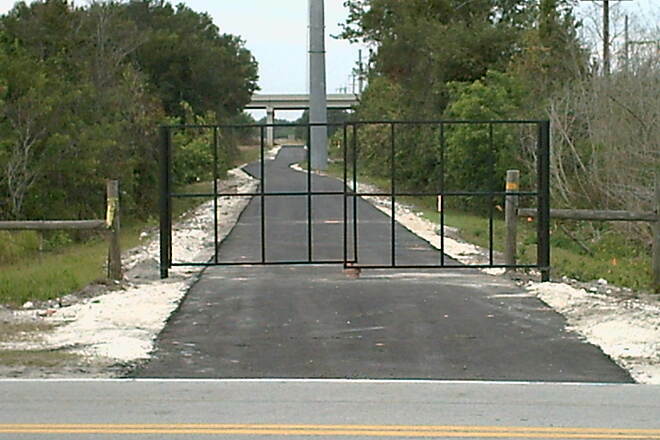 Second, the trail corridor between Braddock Road and Mount Olive Road has been paved, but TECO's gates for the corridor have remained locked. 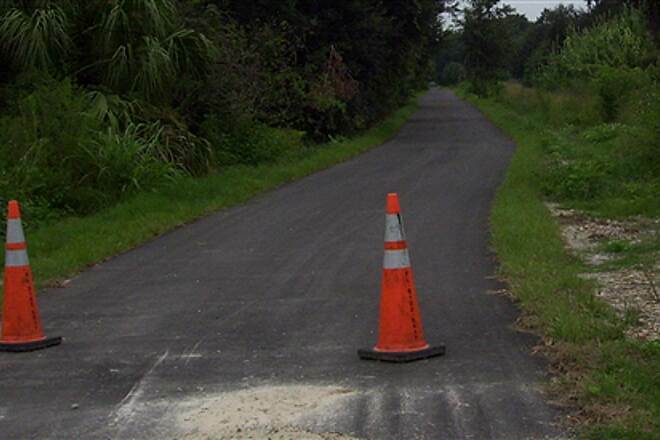 This newly paved portion will be accessable from Braddock Road, Pace Road, and Mount Olive Road." 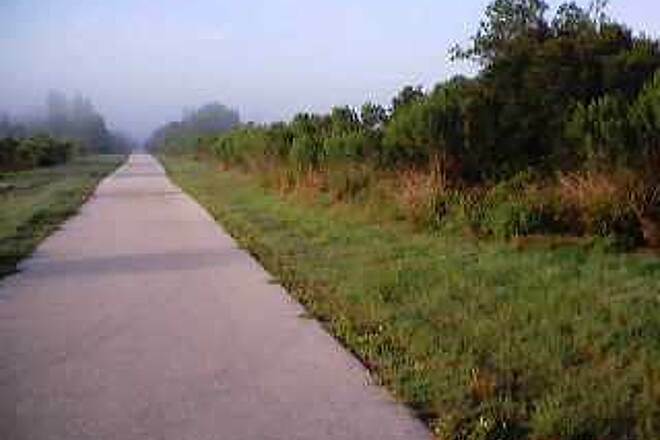 AUBURNDALE -- The Parks and Recreation Department has been awarded a $200,000 state grant that will help extend the Auburndale Trail. Once Auburndale receives the money, which it will have to match, another 2.5 miles of the trail will be paved, said Cindy Hummel, parks and recreation director. The sooner Auburndale can connect to the Van Fleet Trail in Polk City, the better, Hummel said. ""It's good for our citizens,"" she said. ""This will enable them to do more in our community instead of going someplace else."" Auburndale is the only municipality from Polk to receive the allocation from the Florida Recreation Development Assistance Program this year, said Terri Messler, community program administrator for the Florida Department of Environmental Protection. The city completed a 1.2-mile section of the Auburndale Trail last year. This year's grant will mean 3.7 miles of the trail will be paved. The trail will eventually connect to the Van Fleet Trail in Polk City, making the total distance 7.8 miles, Hummel said. She hopes to have the project completed by 2005. 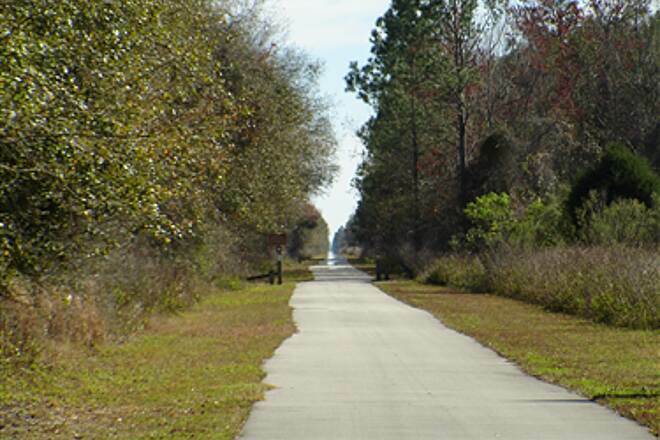 The Van Fleet Trail is 29 miles long, ending at State Road 50 in Sumter County. The city has worked for several years with Tampa Electric Co. and other agencies on the trail development of the abandoned CSX railroad right of way west of Berkley Road. 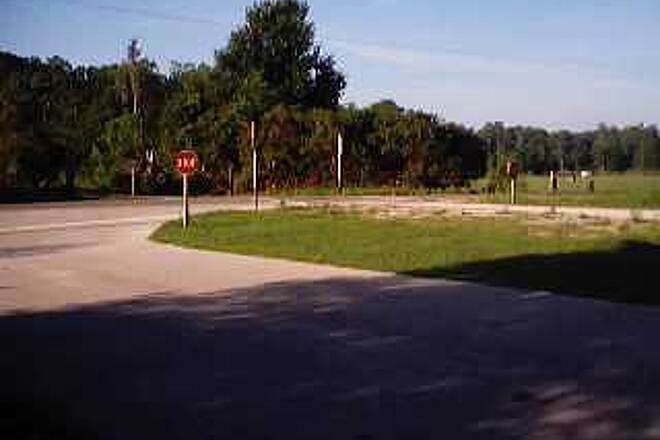 The city bought a portion of the right of way between Lake Myrtle and Braddock Road in 1998. 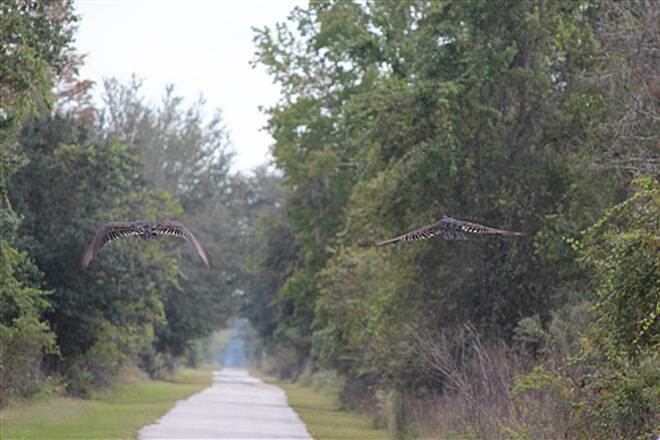 TECO owns the balance of right of way between the city's property and the Van Fleet Trail in Polk City. The property was annexed in January 2001. Both TECO and the city have utilities in the 100-foot-wide parcels between Braddock Road and an area just south of I-4. In 2002, Auburndale entered a 30-year lease with TECO that will allow the city to develop 51Ú2 miles of property between Braddock Road and I-4. The lease will cost the city $1 per year. 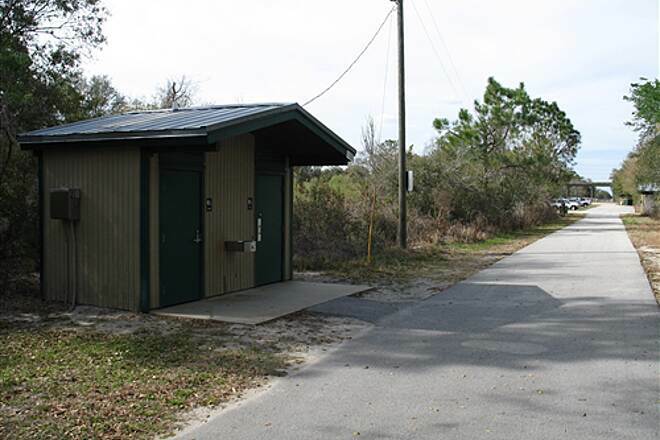 TECO is in discussions with the state Rails-to-Trails program regarding donation of the 100foot-wide parcels north of the interstate that would connect with state property at the Van Fleet Trail. 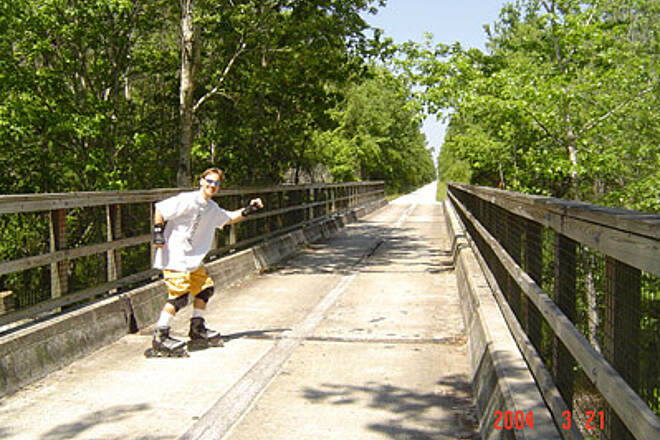 The Florida Rails-to-Trails program, started in 1987, was designed to purchase abandoned railroad corridors and other areas. In addition to hiking paths, such trails are typically used for such recreational activities as bicycling, horseback riding and wildlife observation. Later this year, the city will construct parking and restrooms at the trail. Merissa Green can be reached at merissa.green@theledger.com or at 863-401-6968." "Spring Ride on ""the Fleet"""
Suggestion: start your ride as early as possible, and wear sunscreen! Since the trail runs north/south, the sun can be merciless as noon approaches. Also bring plenty of water..."
"Very good shape - well maintained. Saw 50 turtles, deer and great birds. Over 2 hours I only saw 3 people. They have covered bench areas in the swamp every 2 miles or so. Great Trail. Only 30 minutes from Disney World. I4 West to Polk city make left go to bridge. Trailhead in park under bridge." 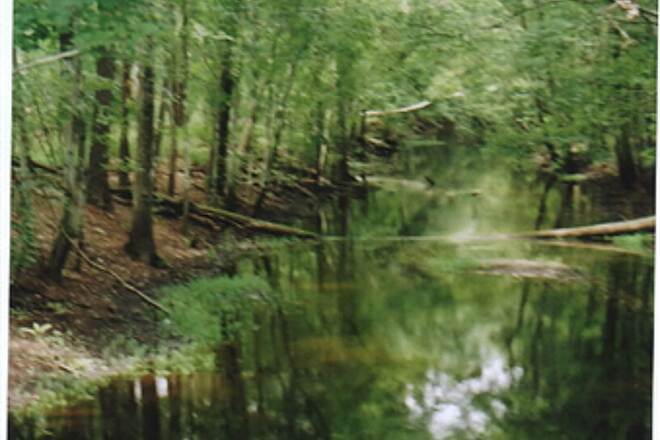 The Withlacoochee River hits a barrier where Polk County meets Lake County. The barrier opens in three places and the blackwater stream pushes through on its way westward to the Gulf of Mexico. 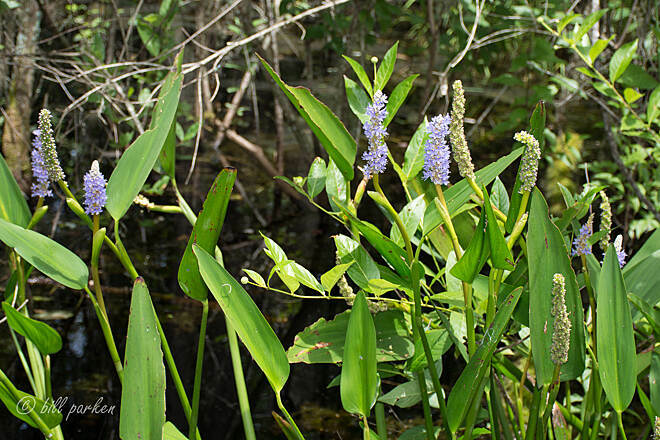 Sometimes you can hear baby alligators grunting from the protection of the tangle of pickerel weed, primrose willow and other aquatic plants. 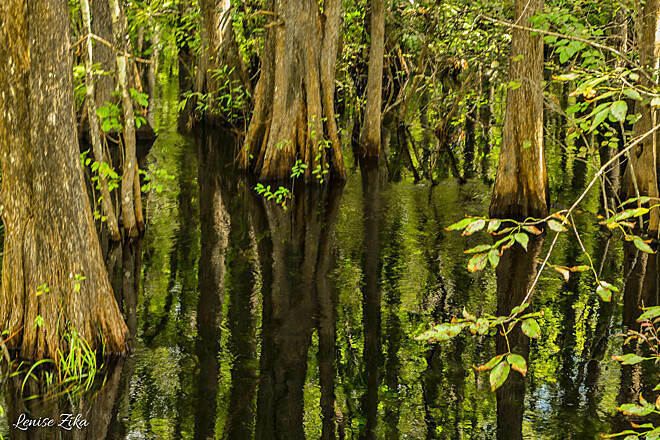 The alligators and the rush of the river are audible because this is the middle of the Green Swamp, miles from urban noises, 12.6 miles to be exact. 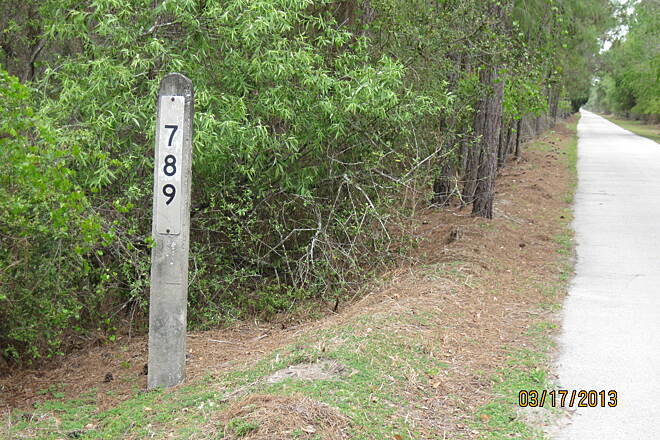 That's what the distance marker on the pavement of the Van Fleet Trail says. The marker measures the distance from Polk City, the trail's southern beginning for hikers, bicyclists, rollerbladers and horseback riders. The pavement lies on the river barrier, a berm completed in 1925 to support a railroad bed. The long-abandoned set of tracks was built by the former Seaboard Air Line for a route that went from Coleman in Sumter County to West Palm Beach. Today, 29.2 miles of that abandoned rail line have been converted into the Gen. James A. 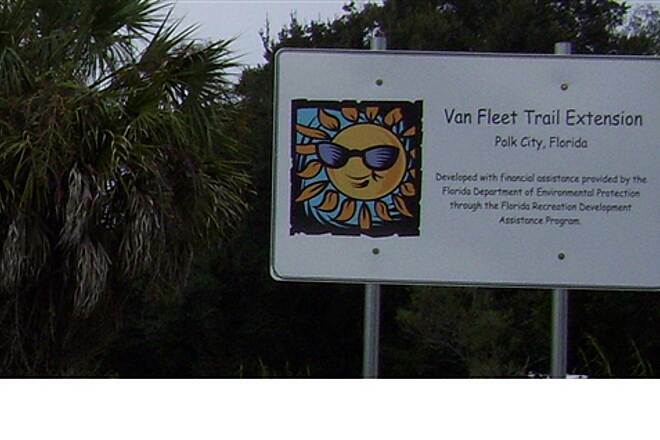 Van Fleet Trail State Park, named after the World War II military leader who was a Polk County native. In June, U.S. Secretary of the Interior Gale Norton named it a National Recreation Trail. 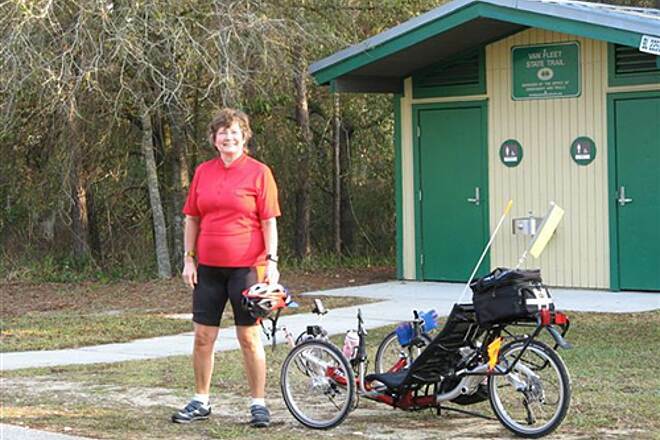 A Ledger reporter rode a bicycle the length of the trail over a recent two-day period. 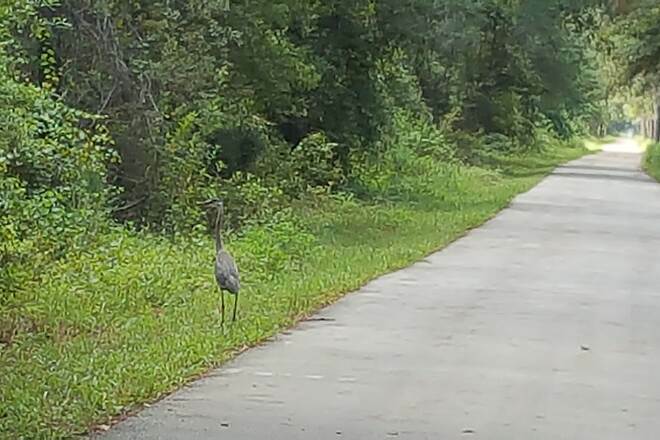 At either end of the trail, whether you're in Polk City next to the State Road 33 overpass or in the unincorporated Sumter County community of Mabel next to the State Road 50 overpass, it is not quiet. Tractor trailers' diesel engines seem even louder from the nearby overpasses, shooting sound waves down the trail. One way to escape the noise is to head down the trail. Some trail riders disappear quickly toward the trail's vanishing point. Preston Hall of Lakeland is unloading his bicycle just after dawn for just such a quick ride. ""I come out here at least once a week,"" he said. Hall likes to ride in the early morning because it's cooler, less humid and he has more opportunities to see wildlife. ""I saw my first bobcat a couple of weeks ago,"" he said. Farther down the trail, Oscar Pimentel of Polk City is returning from his regular weekday exercise ride. He said he has been riding on advice from his doctor after a quadruple bypass operation. But there are long stretches with no encounters between trail users, at least on a recent weekday. As the highway noise dulls, other sounds replace it. A red-shouldered hawk calls from somewhere among a forest of maple, bay, pine and cherry on one side of the trail. On the other side of the trail, a ribbon of underbrush gives way to a pasture below the trail. For the moment the cattle in the pasture are intent on grazing and say nothing. Not far down the trail, a subdivision with its own airstrip appears on the right. A little farther, unpaved ranch roads cross the trail. The vegetation changes at irregular intervals. 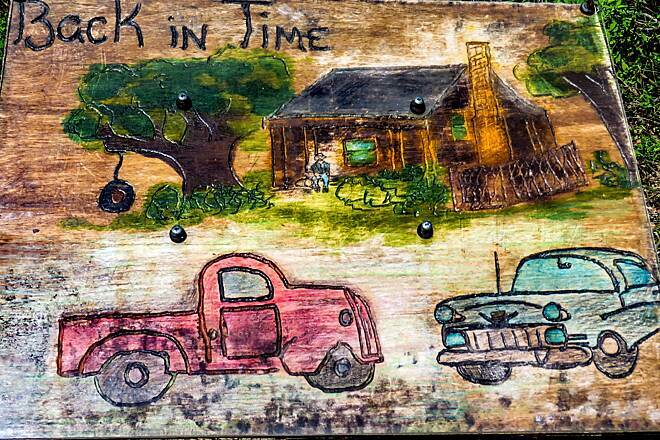 In some places there are pastures, then there's a strand of wax myrtles, slash pine and water oak, then there's more pasture or open pine woods or a cypress swamp or a marsh or a stand of sweet gum. This is, after all, the Green Swamp, a place that collects and holds water even in the places that are not swampy. 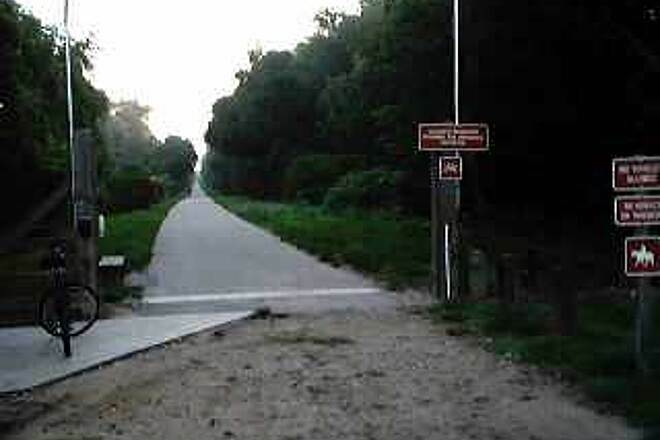 Some bicyclists disparagingly refer to the trail as the ""Van Flat."" It certainly appears flat, in the sense that it is not hilly. But the trail's seeming flatness is an illusion. 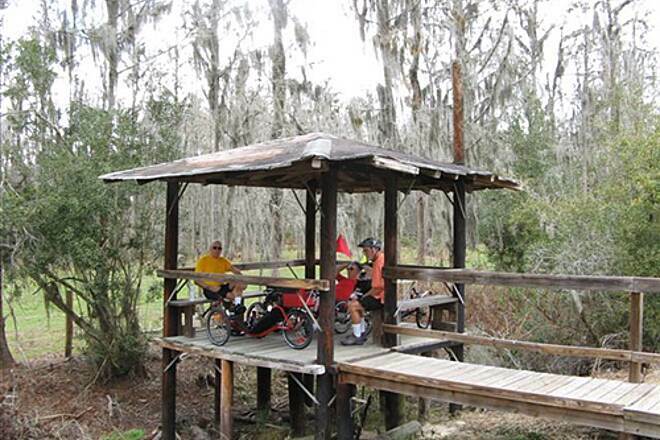 The Polk City trailhead sits about 135 feet above sea level. 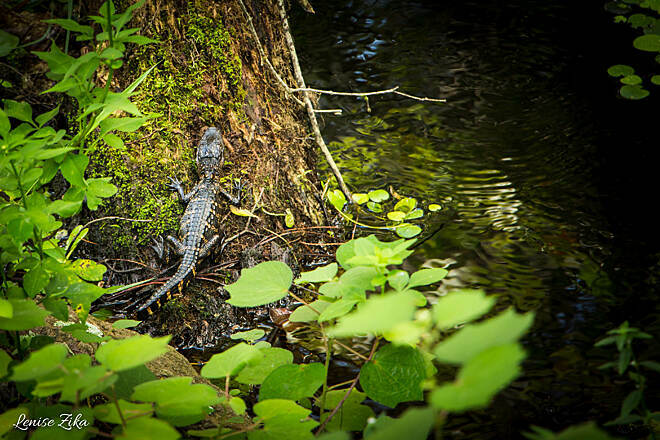 By the time the trail crosses the Withlacoochee River swamp, the elevation has dropped to 105 feet. The trail elevation rises again to 113 feet north of the river, but drops to 103 feet at Bay Lake Road, the next trailhead near an area known as Bayroot Slough. By the time the trail ends in Mabel, it is about 95 feet, a drop of 40 feet from Polk City. Whatever the trail's elevation, it is usually higher than any of the surrounding countryside. That is, except when it crosses a place in Lake County called Carter's Island, a small hill that rises to 130 feet. Here the railroad line was cut through sand and rock that rises 8 to 10 feet above the trail. There are oaks and sandhills here instead of cypress and standing water. There has been some talk of trying to set up a primitive campground here. Carter's Island is one of those sights that adds interest to a trailside view that generally seems to change in predictable and not very interesting ways. But if the general view is unexciting, the micro-views can be fascinating. You may look down and see an oval-shaped hole a few inches wide with its main occupant, a gopher tortoise, peering out tentatively. The hump of land upon which the trail sits is ideal for gopher tortoises, who look for high and dry living spaces. Many congregate in the relatively dry section of the trail around the Green Pond Road trailhead, a quiet area, whose serenity is broken only by the occasional roar of farm equipment or a crowing rooster. Sometimes you should look up. On one side of the trail in a maple tree hangs a respectable-sized hornet nest, not a common sight around here. Flying just above the trees, a trio of Eastern kingbirds are migrating south. Far higher a red-shouldered hawk circles in the thermals. All types of wildlife live along the trail, though it will take repeated visits to see many of them, said Mike McCarthy, the trail's ranger. ""The more you come, the more you'll see,"" he said. Wildlife surveys so far have turned up 102 species of birds, 60 species of butterflies, 11 species of reptiles and amphibians and nine species of mammals. 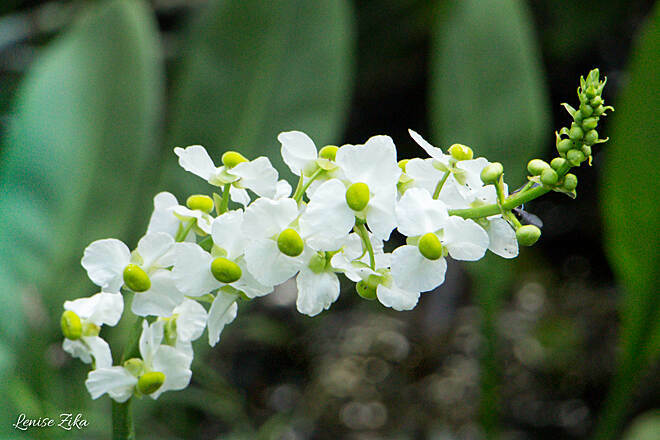 In addition, biologists have identified 159 species of plants along the trail. Those plants can grow in interesting combinations. At the edge of the Withlacoochee floodplain, a giant red maple tree supports an impressive collection of bromeliads and resurrection ferns. In Bayroot Slough, a colorful swamp-dwelling prothonotary warbler gleans insects from tree branches. Sometimes it's better to focus in the distance to see interesting things. South of the river a family of raccoons 100 yards away quickly crosses the trail, disappearing quickly into the undergrowth. In another place, about three miles south of the northern end of the trail, a low pasture stretches off the west, interrupted by cypress domes. Spots of color -- yellows and pinks -- dot the field, evidence of polygala and meadow beauty that stand out against the plainer colors of the grasses. Then there's movement and three white-tailed deer appear from hiding in the tall grass and disappear again behind a cypress dome. A few barn swallows, darker blue than the sky through which they move, zip quickly southward. In another field south of Bay Lake, wild turkey move through the grass, only their featherless heads visible. More birds appear at another trail crossing, one that's aerial instead of terrestrial. Eighty-one black vultures, one wearing the telltale yellow wing tag of a biological research project, sit atop the giant metal frameworks of the electric transmission line. They finally begin soaring as the day warms, joined by a pair of turkey vultures. All eventually disappearing as black dots against the sky, creating their own invisible trail. At the north end of the trail, people appear again. Jim and Peggy Coleman, who just moved to Clermont in nearby Lake County in July, are new converts. ""We're going to be using it,"" Jim Coleman said. McCarthy, the ranger, said the Colemans aren't the only new people discovering the trail. He said estimated trail use has grown to about 35,000 visitors a year, up 1,000 or so from a year ago. Although use is growing, it is still considerably less than urban trails, such as the 34-mile Pinellas Trail, which attracts 90,000 users a month. But most of the people who visit the Van Fleet Trail don't travel far, which means staring at the rippling Withlacoochee River can still seem like a fairly solitary experience. But then a bullfrog or a Carolina wren break the silence and you realize you're never really alone on this trail. Tom Palmer can be reached at tom.palmer@theledger.com or 863-802-7535." 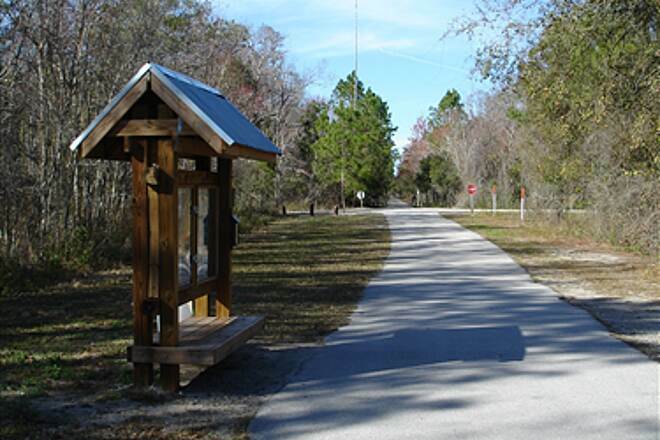 AUBURNDALE -- The Auburndale Trail officially connects with the Van Fleet Trail in Polk City this week. City officials will open the trail at 10 a.m. Thursday. Polk County and state officials have been invited to the ceremony opening the nearly 4-mile final stretch. Cindy Hummel, parks and recreation director, said she's excited about the trail's completion. ""There are so many people that are into walking and rollerblading,"" she said. ""I think it's a great addition to our recreation in Auburndale."" 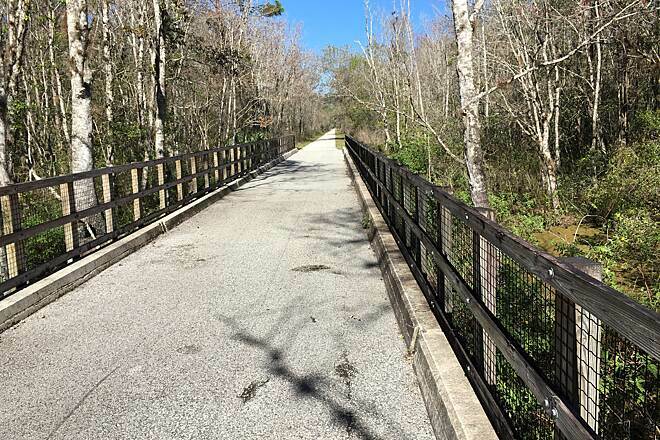 The addition of the extension creates a 40-mile trek from the Auburndale trail head to the end of the Van Fleet Trail near Mabel in Sumter County. Auburndale spent $95,445 developing the trail extension. The commission approved a 30-year lease in January with Tampa Electric Co. that allowed the city to develop 3.9 miles of property between Braddock Road and Interstate 4 so that the two trails can be connected. The lease costs the city $1 per year. The city received $5,000 from Gulf Stream National Gas Systems for shelters, two covered benches on platforms and trash cans, Hummel said. In the 2002-03 proposed budget, parking and restrooms for the trail are planned, costing $125,000. Hummell said $75,000 of that amount is from a Department of Environmental Protection grant. The city will pay the remaining $50,000. 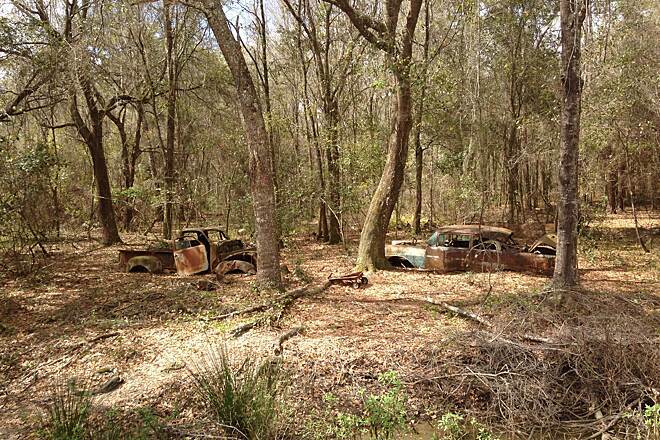 The city has worked for several years with TECO and other agencies on the trail development of the abandoned CSX railroad right-of-way west of Berkley Road. 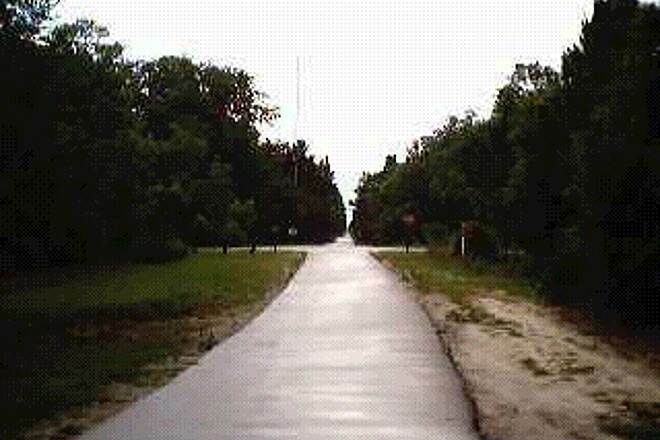 The city bought a portion of the right-of-way between Lake Myrtle and Braddock roads in 1998. 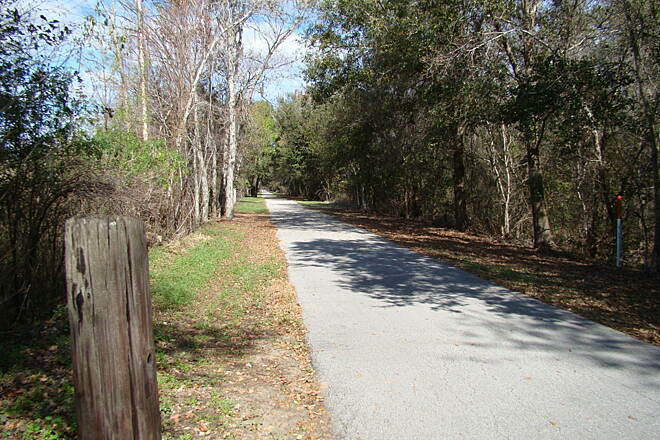 TECO owns the balance of right-of-way between the city's property and the Van Fleet Trail in Polk City. The property was annexed by Auburndale in January 2001. Both TECO and the city have utilities in the 100-foot-wide easement between Braddock Road and an area just south of I-4. 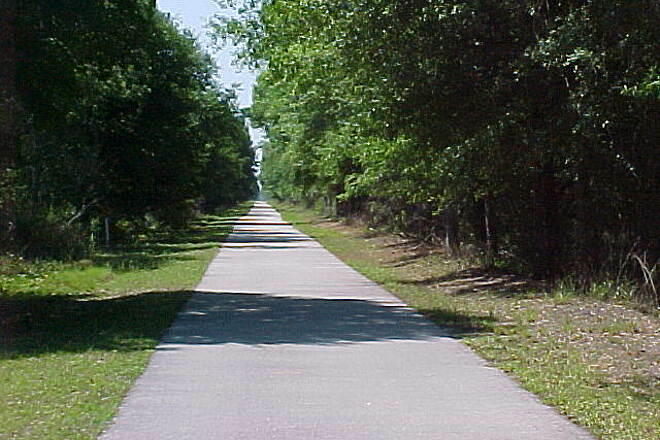 The Florida Rails-to-Trails program, started in 1987, was designed to purchase abandoned railroad corridors and other areas. In addition to hiking paths, such trails are typically used for such recreational activities as bicycling, horseback riding and wildlife observation. Merissa Green can be reached at merissa.green@theledger.com or 863-293-3017." 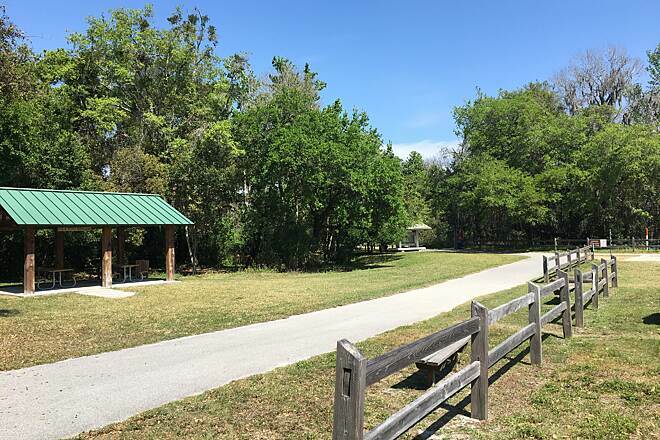 "Auburndale OKs Land Lease for Nature Trail: The city plans to connect the Auburndale and Van Fleet trails in May, making it 40 miles long. 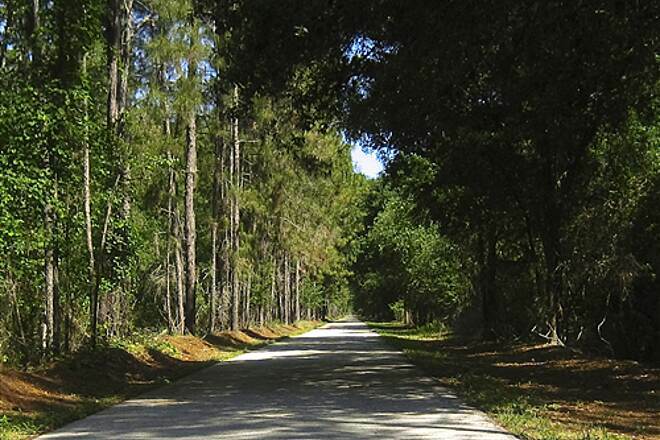 AUBURNDALE -- Nature enthusiasts will soon enjoy a longer journey on the Auburndale Trail. The City Commission unanimously approved a 30-year lease agreement Tuesday with the Tampa Electric Co. that will enable the city to develop five and a half miles of property between Braddock Road and Interstate 4 that will connect the Auburndale Trail to the Van Fleet Trail in Polk City. 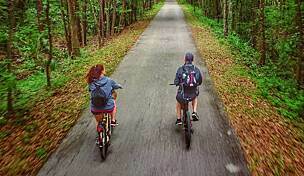 The city plans to connect the two trails in May, making it 40 miles long from the Auburndale trail head to where the Van Fleet Trail ends near Mabel in Sumter County, said Cindy Hummel, parks and recreation director. The lease will cost the city $1 per year. Preliminary plans call for paving the portion of the trail that is within the city. The city has $100,000 budgeted for the project. The trail cuts through 126 acres of Lake Myrtle Park, said City Manager Bobby Green. With all the activities planned for the park, the trail will enhance recreation, he said. ""The trail can become a focus for the park,"" Green said. 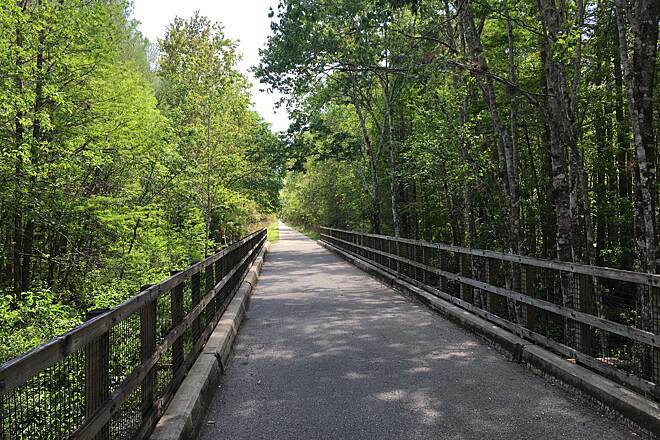 ""It allows us to close the missing link between the Auburndale Trail and the Van Fleet Trail. The city has worked for several years with TECO and other agencies regarding trail development of the abandoned CSX railroad right of way west of Berkley Road. The city bought a portion of the right of way between Lake Myrtle Road and Braddock Road in 1998. 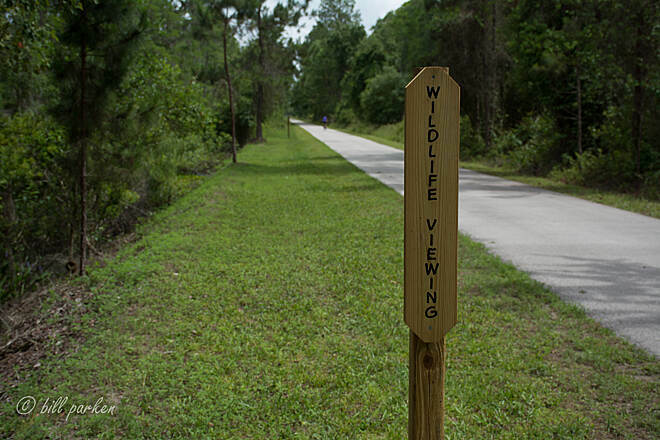 TECO owns the balance of right of way between the city's property and the Van Fleet Trail in Polk City. The property was annexed in January 2001. Both TECO and the city have utilities in the 100-foot- wide parcels between Braddock Road and an area just south of I-4. 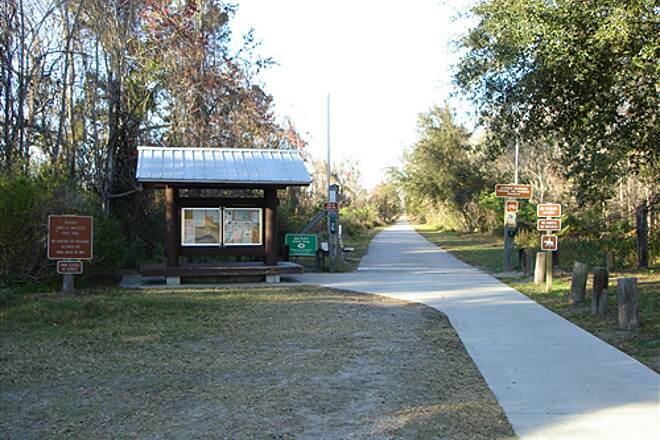 TECO is in discussions with the state Rails-to-Trails program regarding donation of the 100- foot-wide parcels north of the interstate that would connect with state property at the Van Fleet Trail. 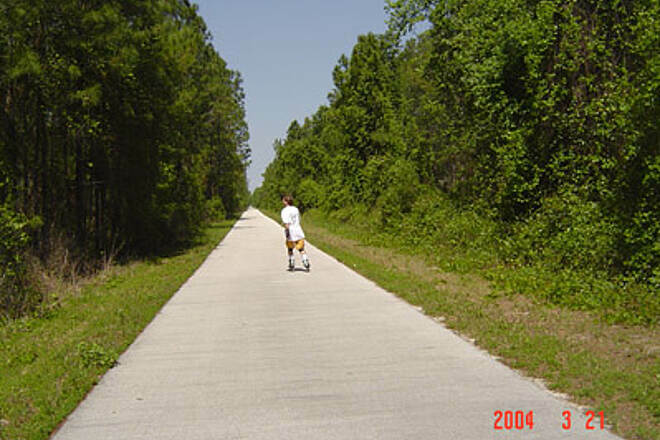 The Florida Rails-to-Trails program, started in 1987, was designed to purchase abandoned railroad corridors and other areas. In addition to hiking paths, such trails are typically used for other recreational activities such as bicycling, horseback riding and wildlife observation. TECO went back and forth on the draft stage of the agreement, said Cynthia Price, TECO's regional manager. ""We are pleased as a company to have this continued relationship in the community,"" she said. ""I think it's a win-win situation for all."" Hummel said she's real proud of the agreement. ""I go to the trail frequently and I hear so many comments,"" she said. ""It will enhance recreation on the trail."" Commissioner Jim Moody is excited about the connection. ""I'm real tickled by this,"" he said. When Commissioner Marvin Wiley was city recreation director, he said the city had the dream but didn't have the money to extend the trail. Wiley said the extended trail will be wonderful for the residents. ""It looks like a beautiful plan,"" he said. ""I think it's perfect the way it's falling into place."" Merissa Green can be reached at merissa.green@theledger.com or at 863-293-3017. "My wife and I rode the length of the General Van Fleet trail yesterday and it was an excellent ride. The northern end of the trail passes through the “Great Green Swamp” so there are enough trees to block the sun except when it is directly overhead. 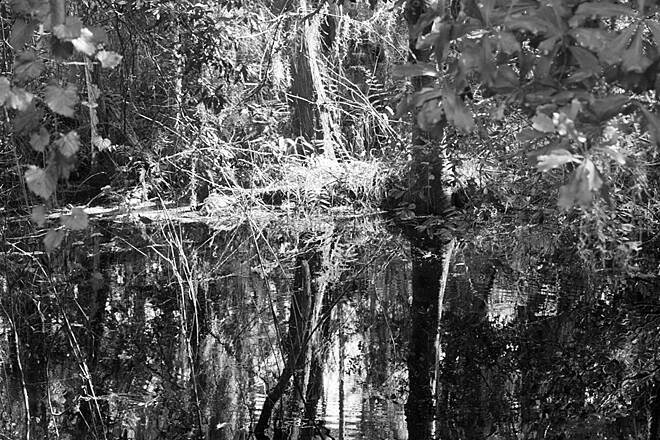 The swamp makes for a very interesting and beautiful ride. 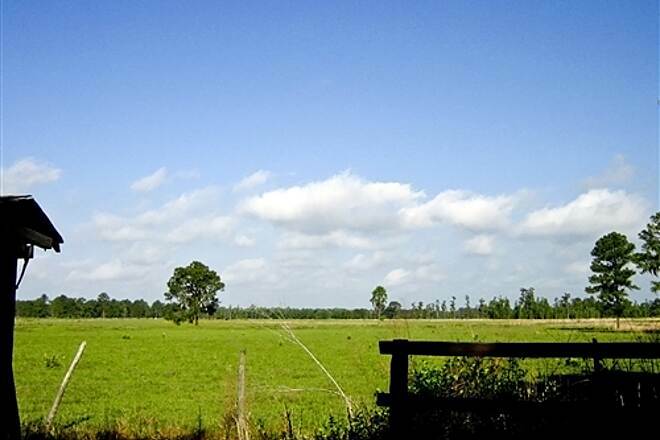 The southern end is more open and passes through pastures and open fields. There are still some well-shaded areas along this end of the trail. And it too is quite beautiful. The volume of traffic, level of safety, and quality of the riding surface will be of interest to fellow cyclists. There are no cars. Down and back we encountered 15-20 other cyclist, 3 joggers, a couple walking, and one guy walking his dog. 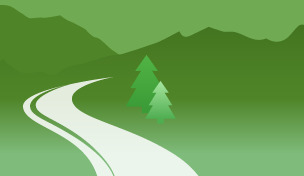 The trail surface is smoothly paved and well maintained from highway 50 to highway 33. The trail is flat and straight. There is only one curve in the whole trip and it is so long it’s almost unidentifiable as a curve. For the full length of the trail, round trip with a side trip to lunch, my cyclometer read 58.96 miles. There are clean, well stocked restrooms at each end of the trail and another about a third of the way up from the southern end. There is no shortage of wildlife along the way. 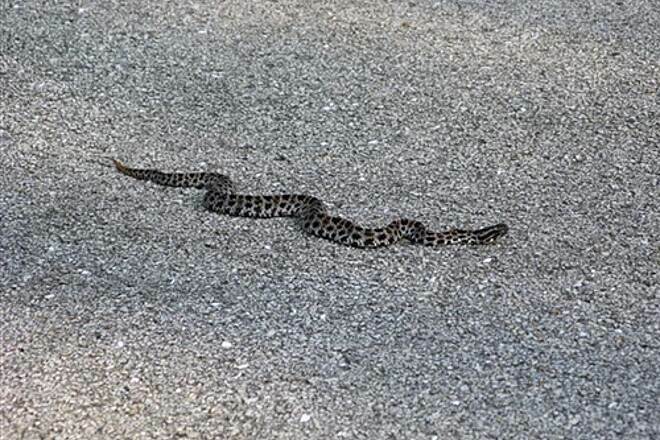 We saw three snakes (non-venomous), a baby rabbit, several huge gopher turtles, a variety of falcons, hawks, and other large birds of prey, and a large whitetail doe. We started at the northern end. At the southern end we turned left on the road and went a block or two to highway 33, left on 33, and found two restaurants in the next block. We had lunch at Walt’s Restaurant. A quaint little place where one of the waitresses had a t-shirt with Confederate flag on the back and without exaggeration half of the patrons were wearing camouflage outfits. There was only one sedan in the parking lot, the rest were large new pickup trucks. The food was good, the people were polite, the children were well behaved, and some said grace before they ate. They list several homemade cakes and pies on a whiteboard inside. It was a very pleasant meal and we will undoubtedly return on our next trip. The General Van Fleet trail is an outstanding ride. We put it off far too long but we will return often. EXTENSIONS OF GENERAL VAN FLEET TRAIL! 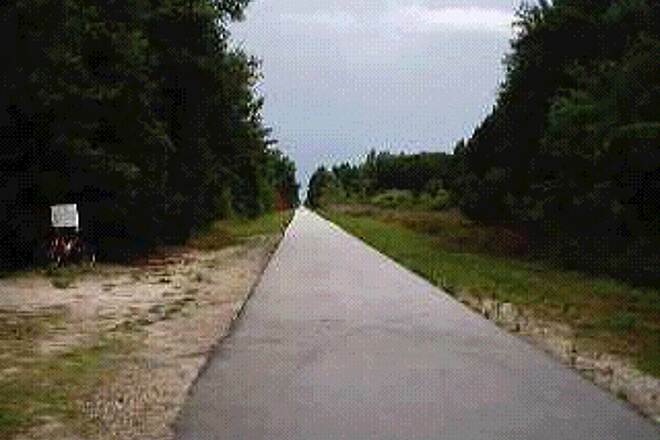 "AT THIS TIME LAKE COUNTY IS PLANING TO CONNECT THE G.VAN FLEET TRAIL TO THE CLERMONT TRAIL IN CLERMONT, FLORIDA.THE CLERMONT TRAIL ALREADY HAS ACCESS OF LINKAGE WITH LAKE MINNOLA TRAIL.LAKE COUNTY IS ALSO WORKING WITH THE WEST ORANGE TRAIL FOR CONNECTIONS WHICH HEADS UP TO APOPKA, FLORIDA.ON THE SOUTH TERMINAL OF THE VAN FLEET TRAIL POLK COUNTY IS WORKING ON CONNECTIONS WITH WITER HAVEN AND LAKE ALFRED TRAIL JUST WEST OF THE VAN FLEET TRAIL. IF YOU CHOOSE TO RIDE THE VAN FLEET TRAIL, BRING WATER AND FOOD, BECAUSE MOST OF THE TRAIL IS IN THE COUNTRY.WHILE RIDING STAY AWAY FROM WILDLIFE!! ENJOY THE TRAIL AND HAVE A GOOD TIME." "All 29 miles now paved. 12 feet wide. Parking, water, & restrooms at northern end (Mabel). Benches & one restroom with drinking water along trail. 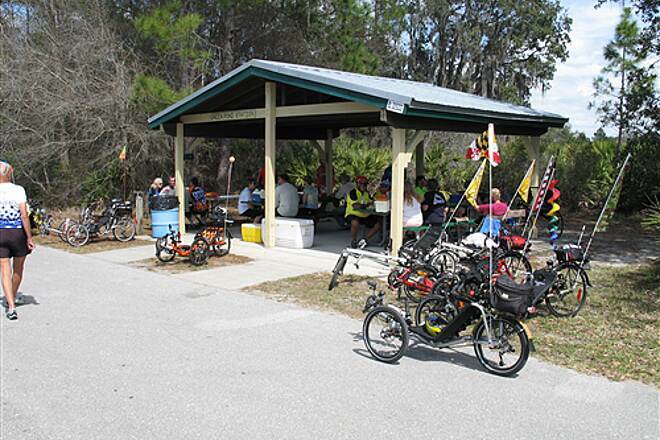 At southern end of trail (Polk City) go 0.2 miles east and 1 block north to restaurant."